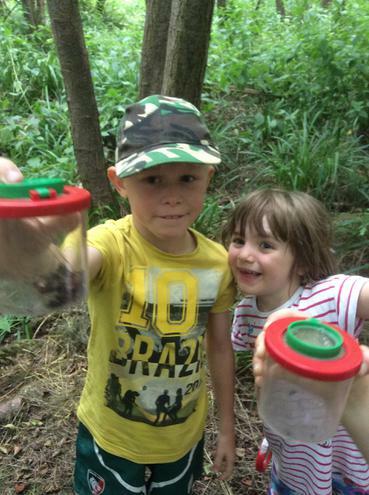 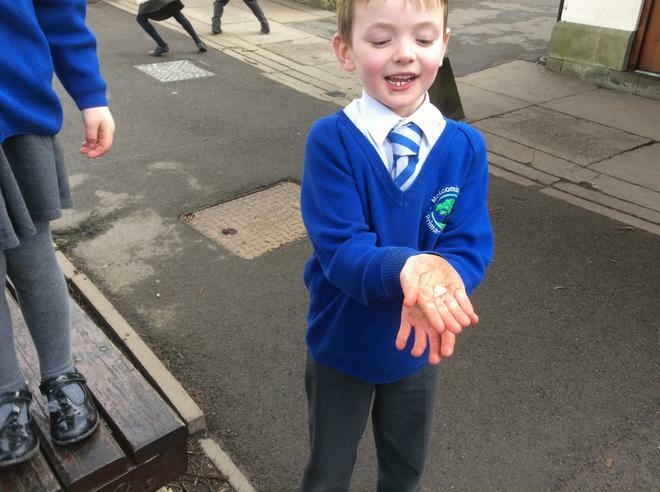 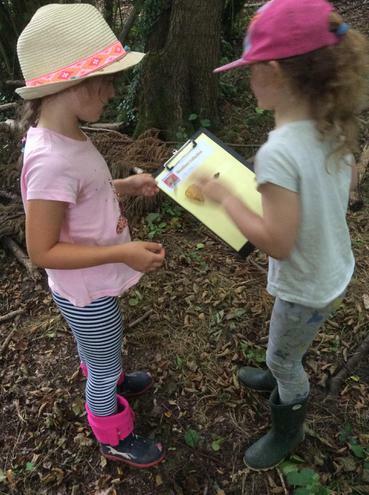 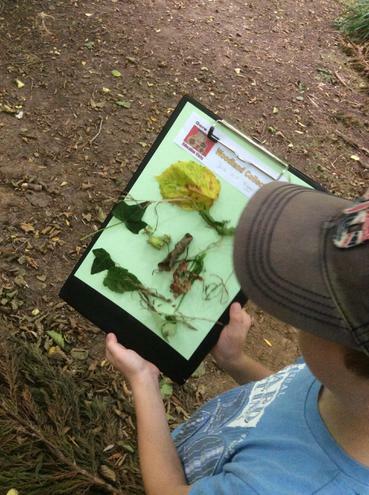 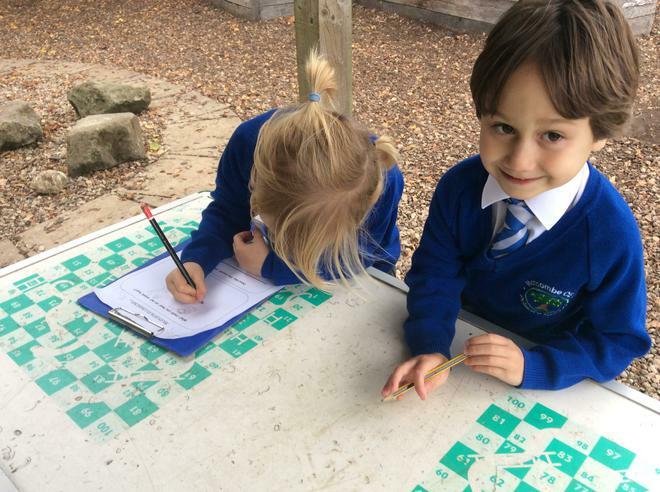 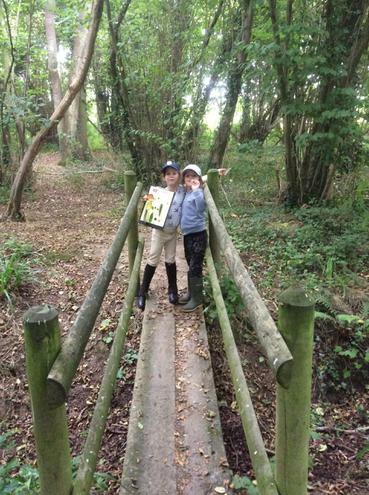 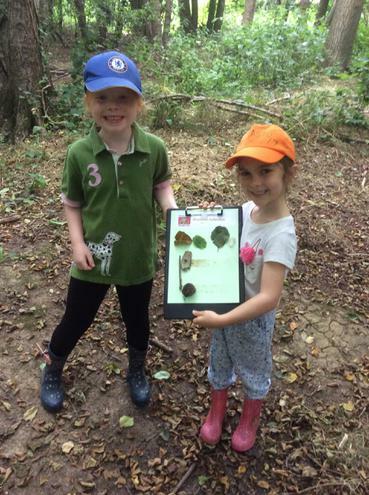 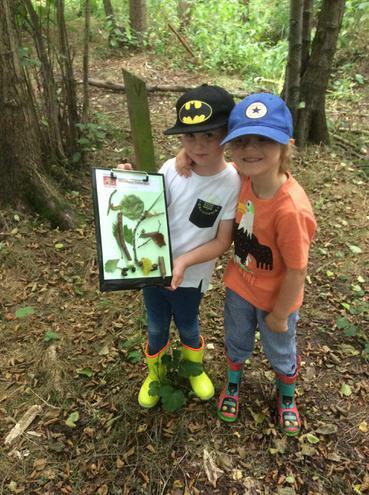 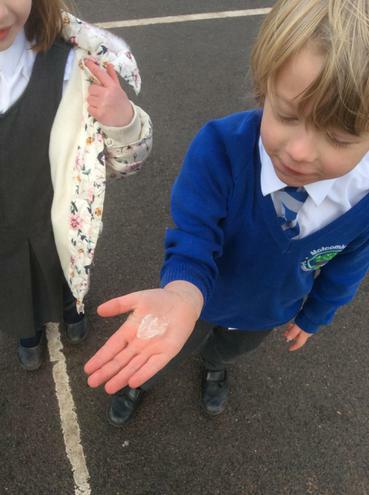 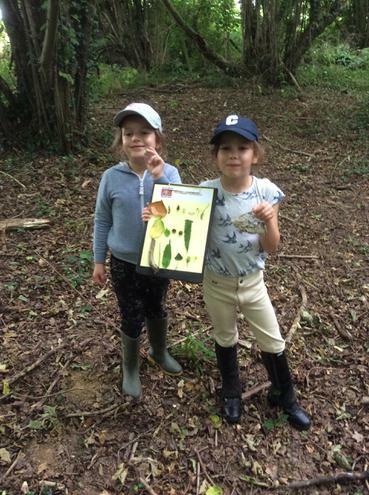 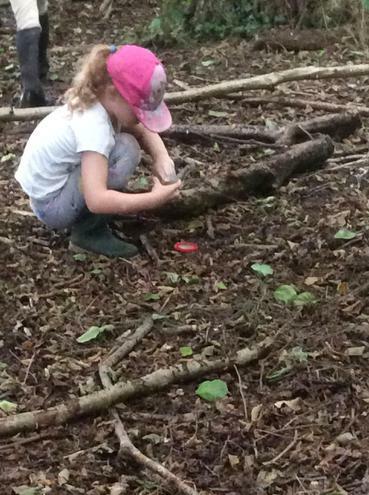 We will continue to be nature detectives this half term. 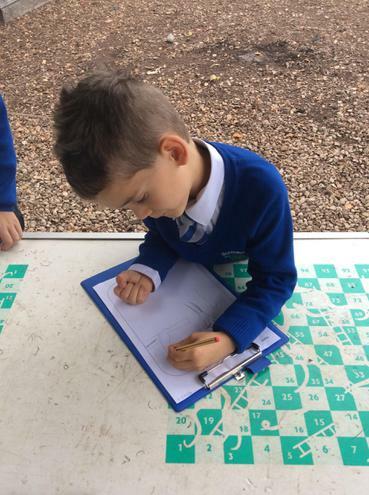 Have a look at the documents below to see what we will be learning about next. 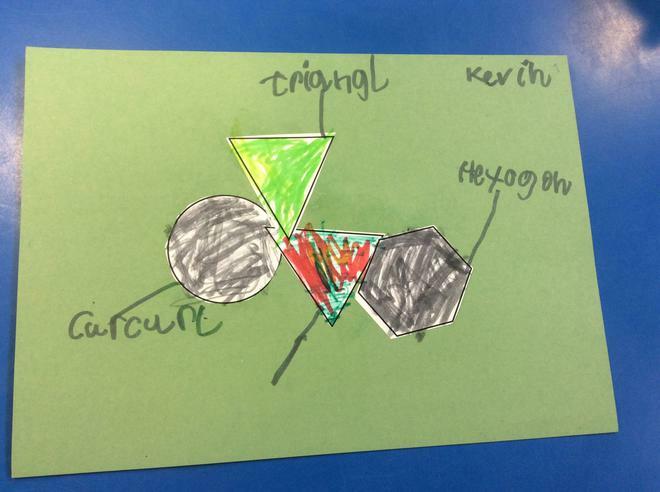 This is a rough guide of coverage; lesson ideas are regularly adapted to meet the interests of the children. 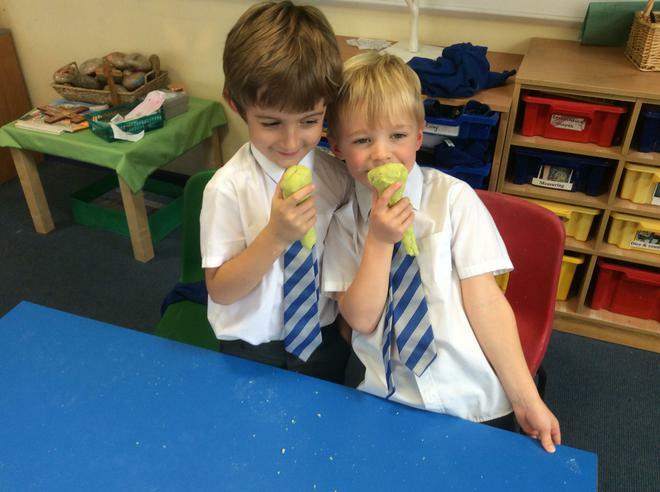 In Wren Class, we make good choices about behaviour. 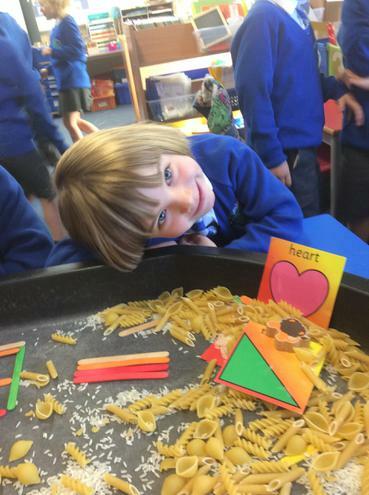 The document below shows how we celebrate this and how we support children to make good choices. 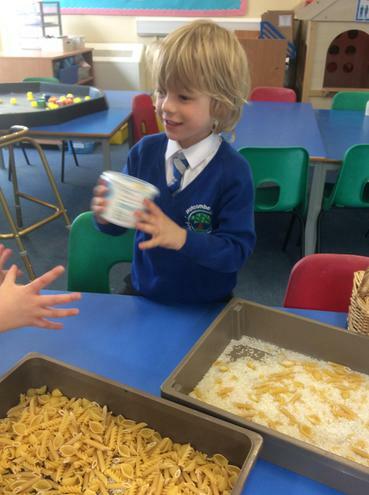 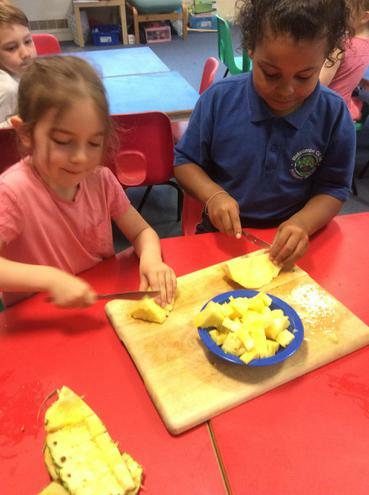 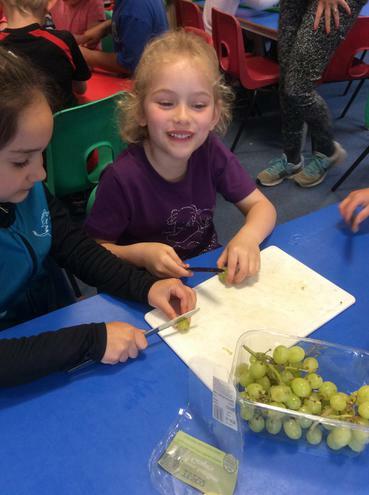 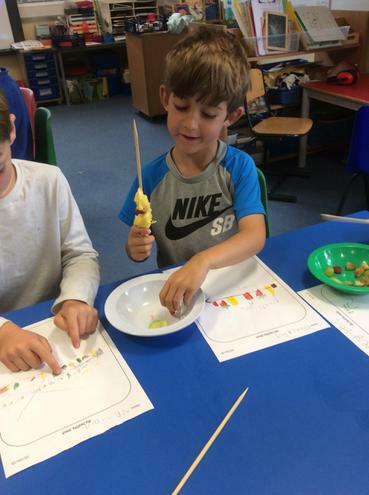 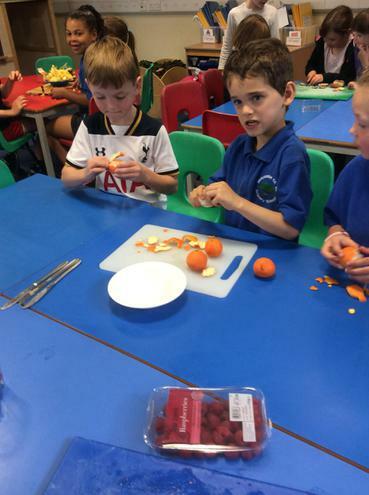 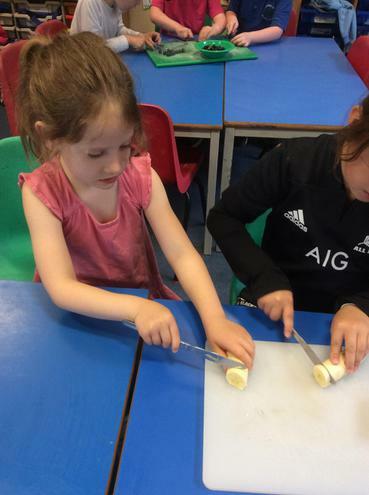 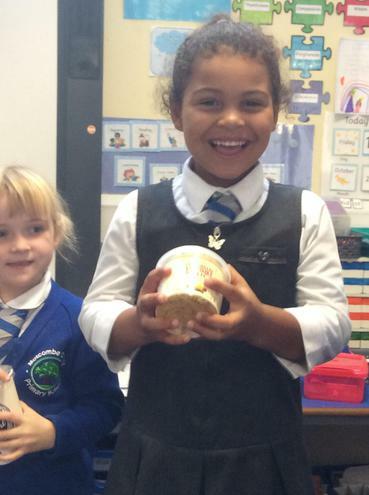 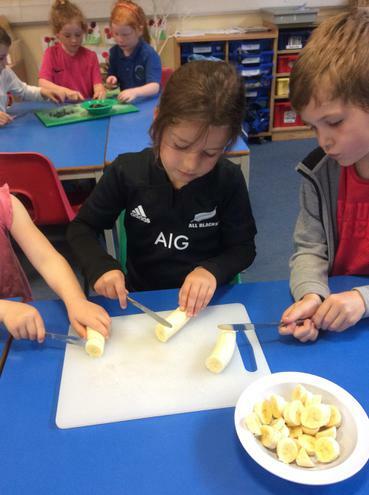 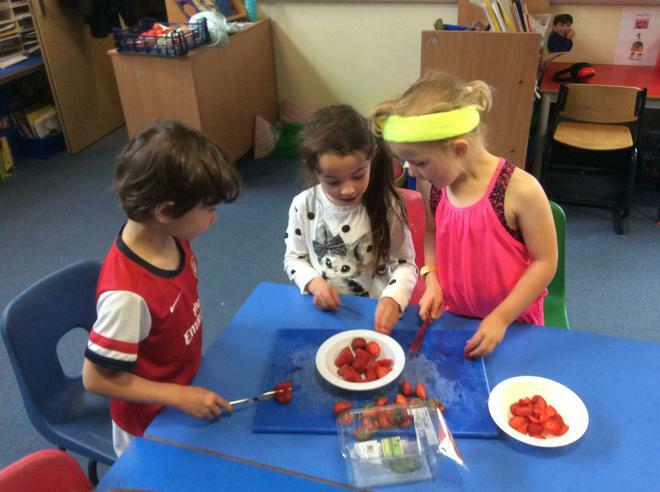 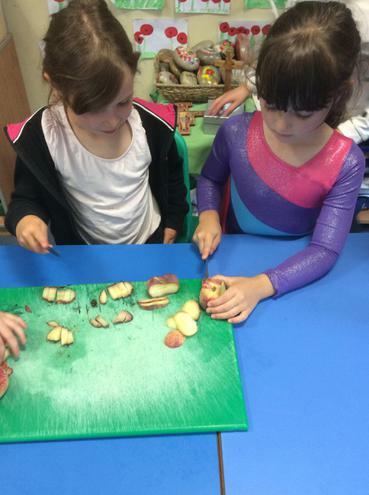 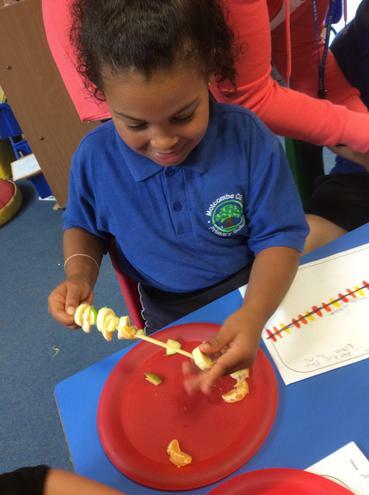 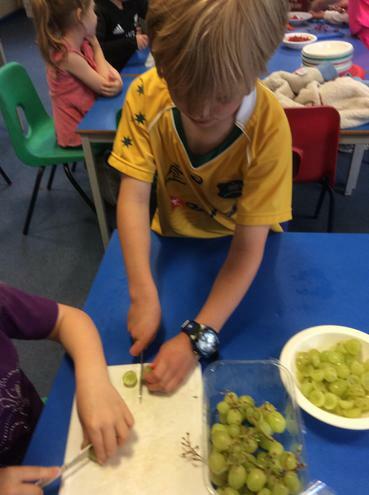 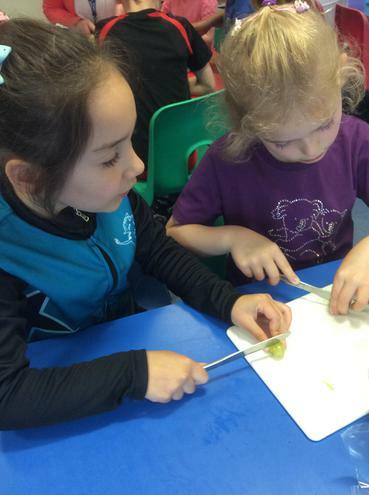 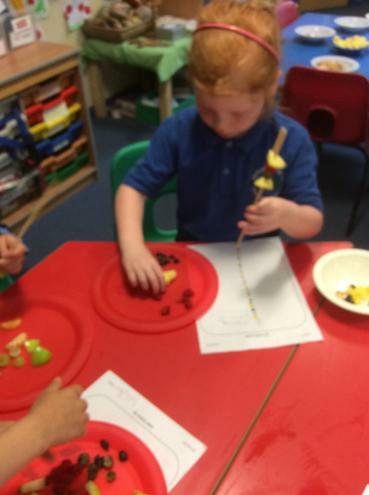 We designed, made and ate a healthy snack this week. 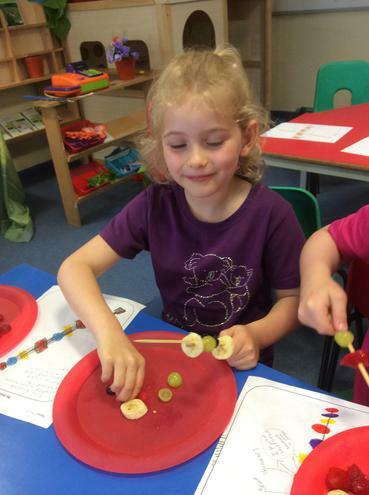 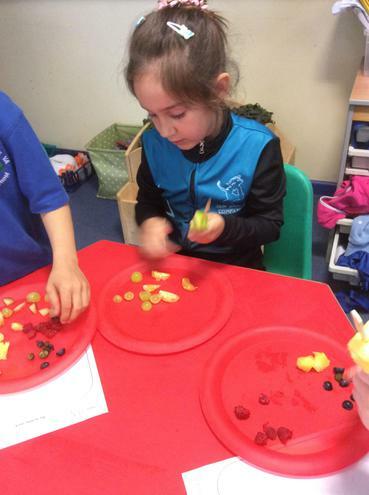 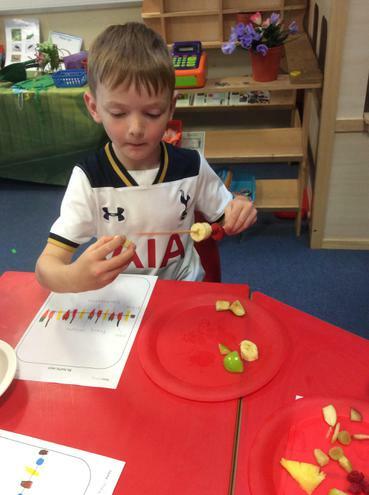 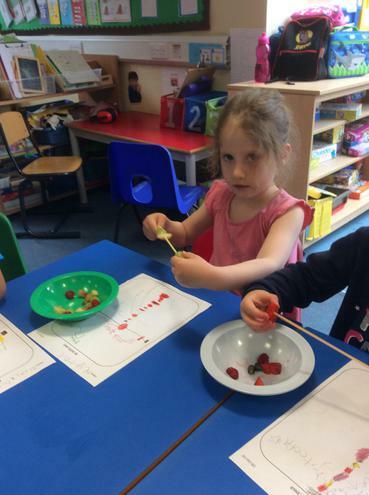 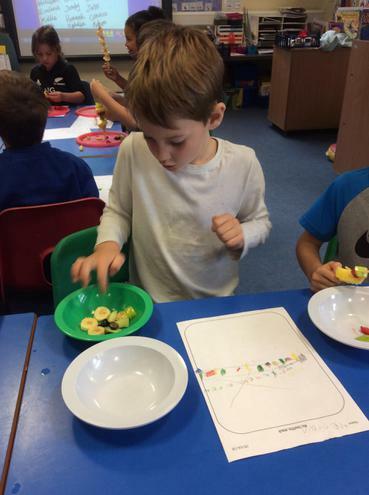 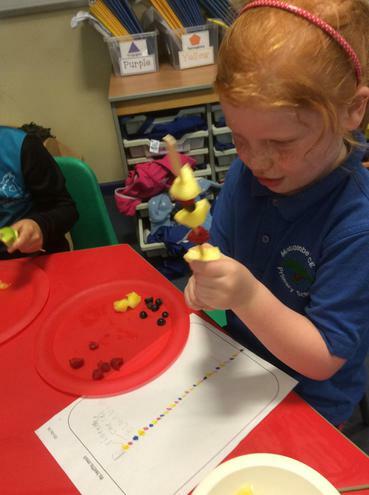 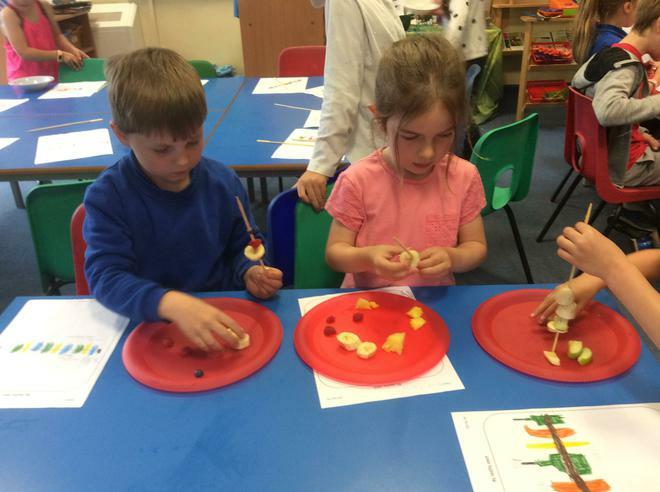 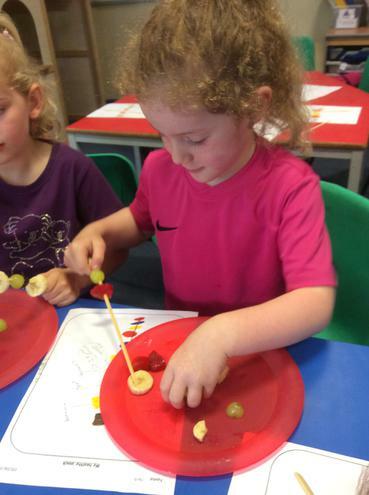 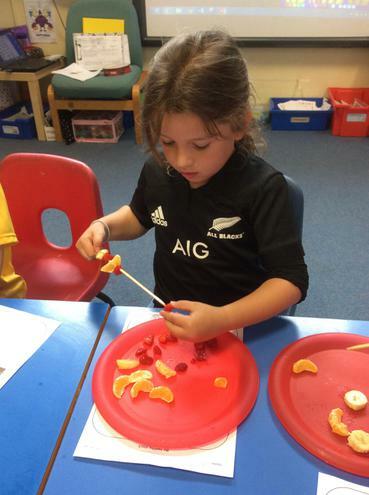 We used repeating patterns in our designs and enjoyed trying a range of different fruit. 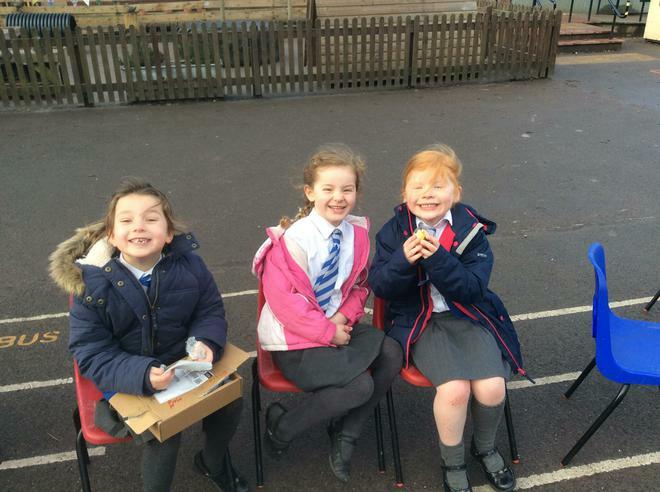 We worked very hard during the cycling challenge. 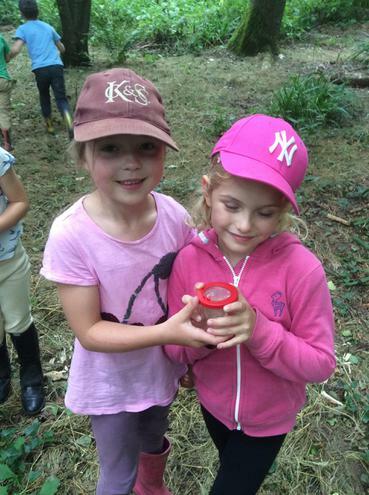 Well done Wrens! 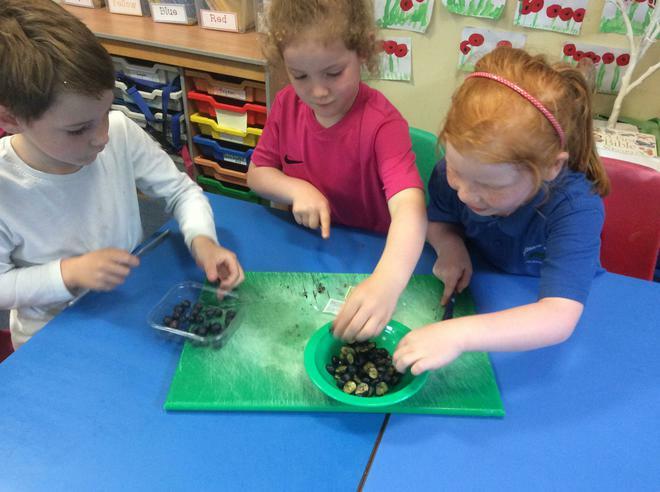 We've been busy planting sunflowers today. 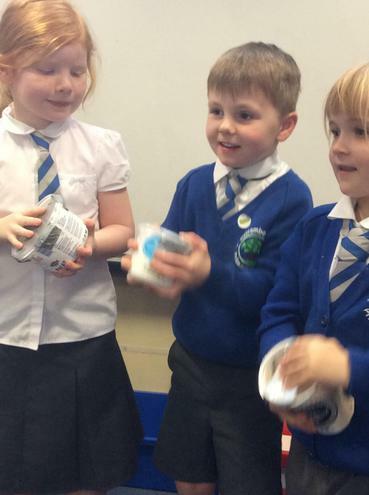 We thought carefully about what we needed to give the seeds to help them grow. 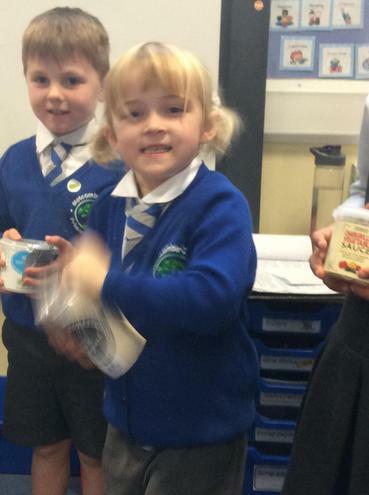 Thank you to Mr Stone for kindly donating the sunflower seeds. 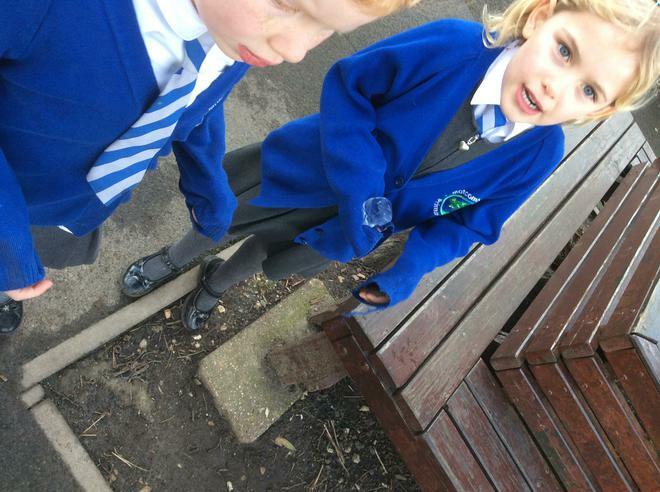 We explored the nature growing on the field today. 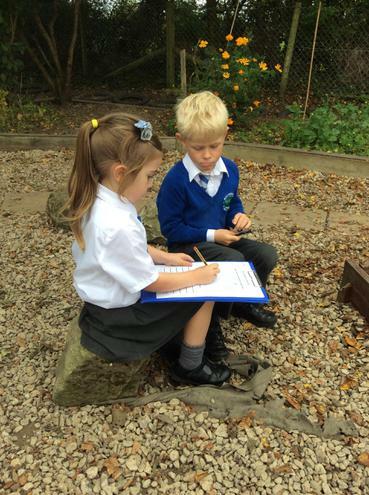 We observed and recorded what we saw using pictures and tallies. 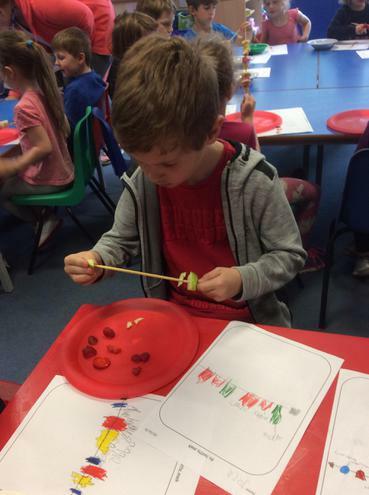 Look at our wonderful hungry caterpillar pictures! 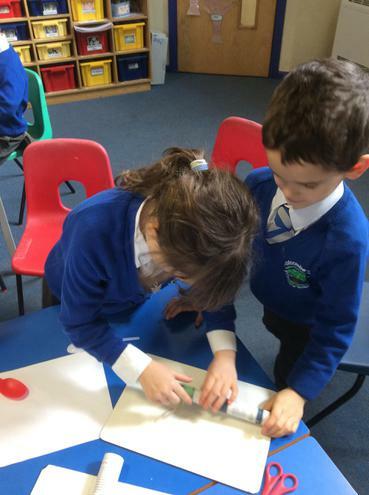 We used pastels and really enjoyed smudging and blending. 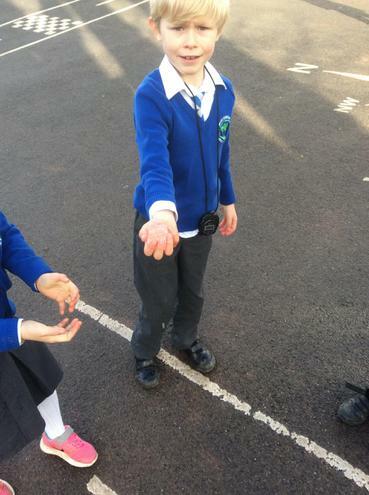 We have been exploring a story called 'The Bugliest Bug'. 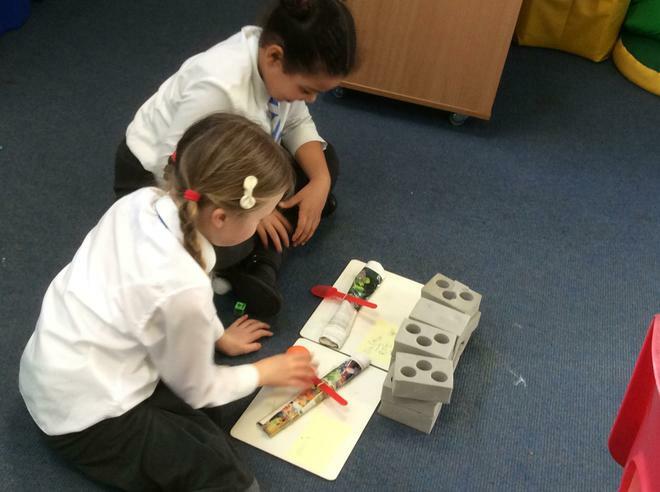 We drew story maps and retold the story with our friends. 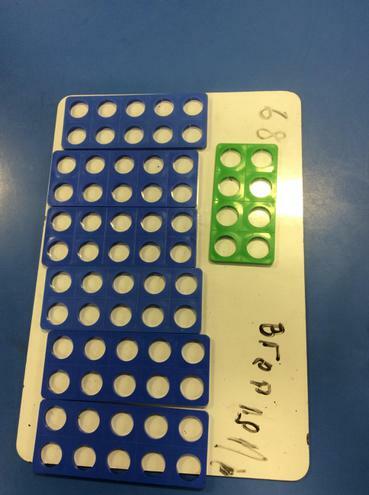 Wrens are very good at dividing. 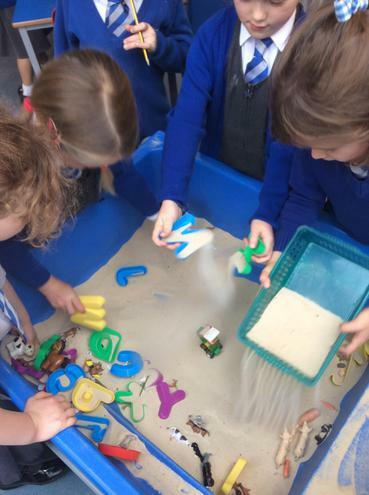 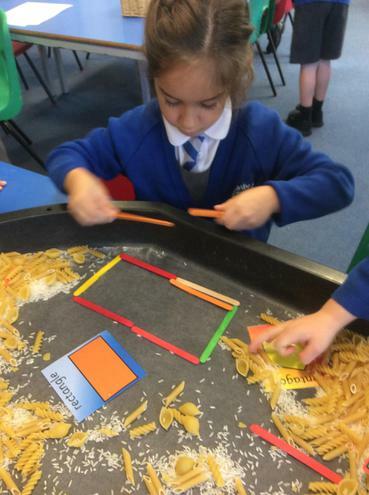 We have been using objects and pictures to help us. 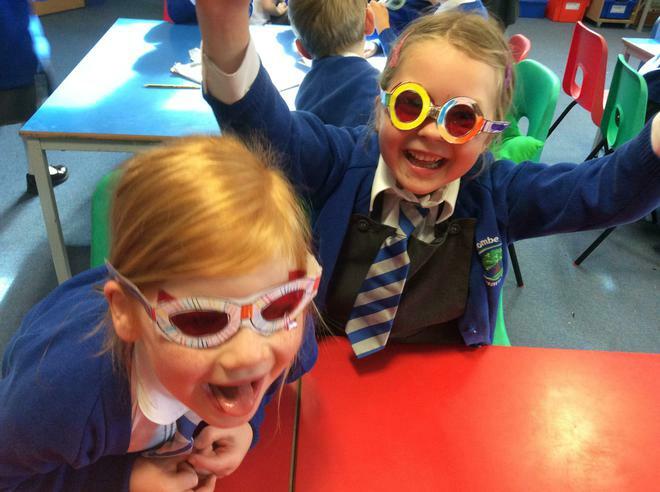 Our wonderful world book day costumes. 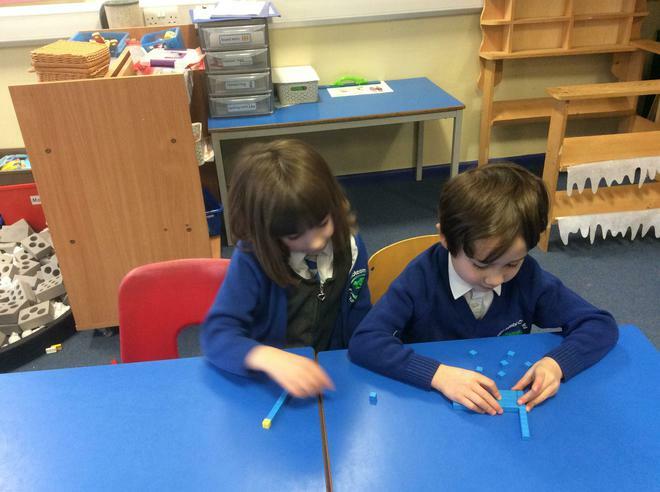 Our new topic for this half term is Kings and Queens. 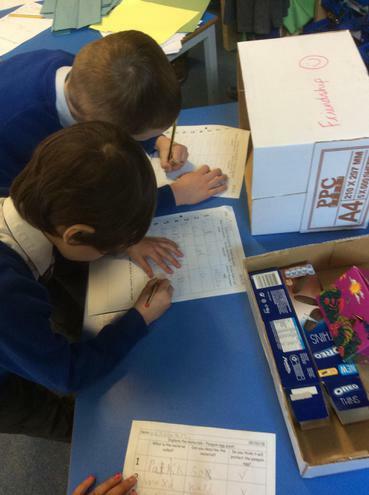 Have a look at the documents below to see what we will be learning about. 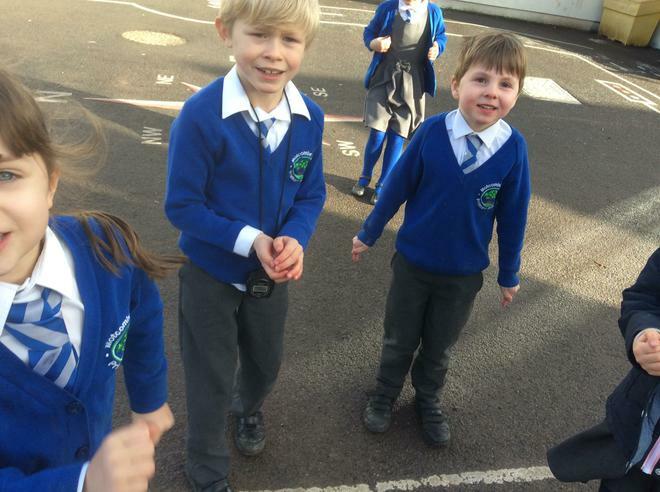 We really enjoyed tennis coaching this week. 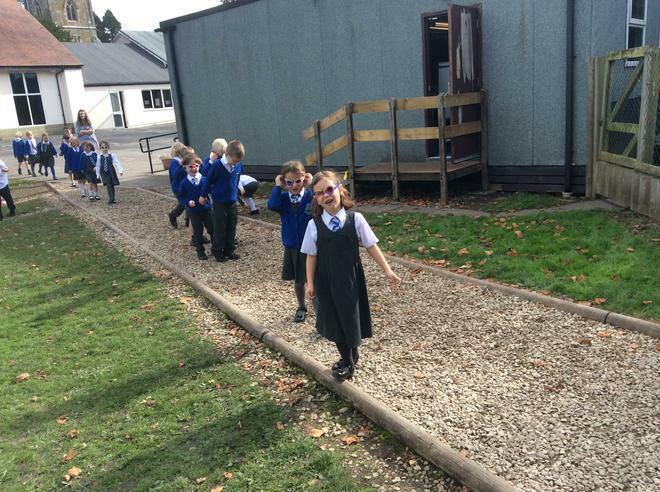 The sunshine made it even more enjoyable! 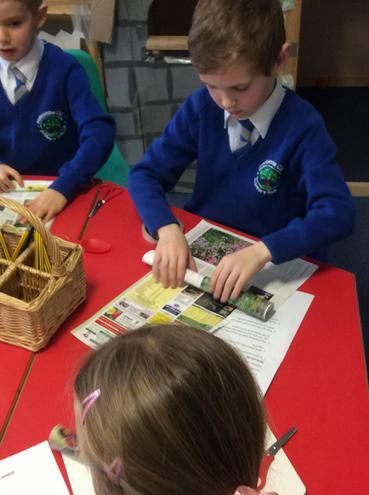 We have been exploring information texts this week. 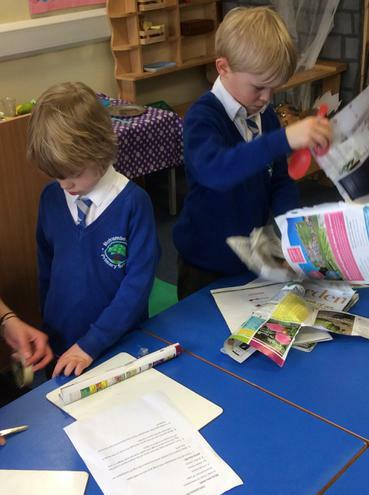 We've been looking for different features and using the contents and index. 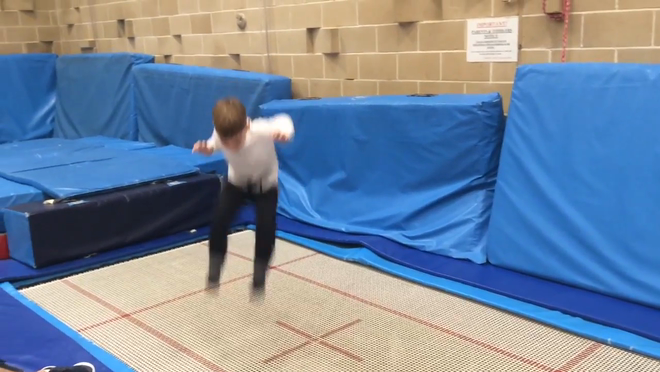 What is the best material to knock down a wall? 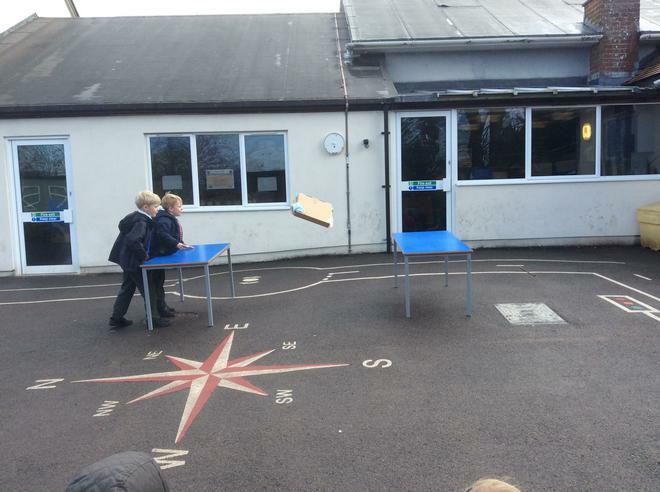 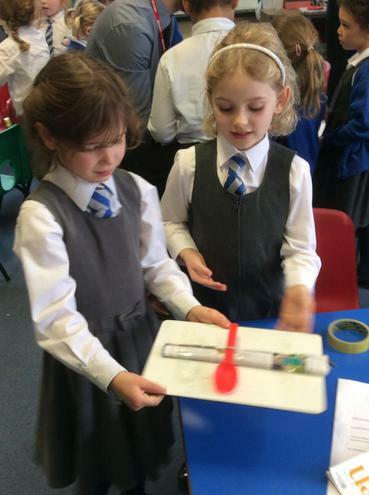 We followed instructions to make a catapult and then used it to help us conduct our experiment. 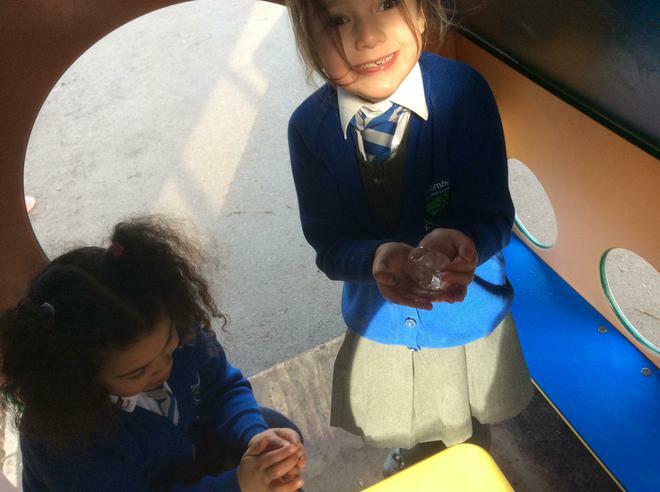 Penguin egg quest. 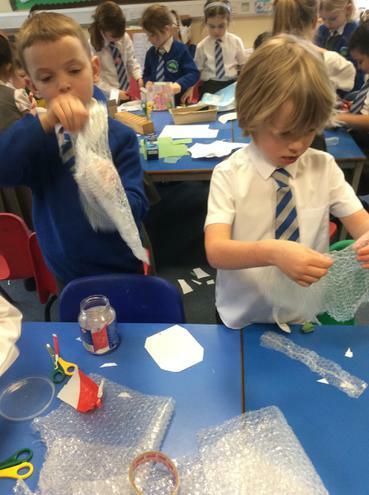 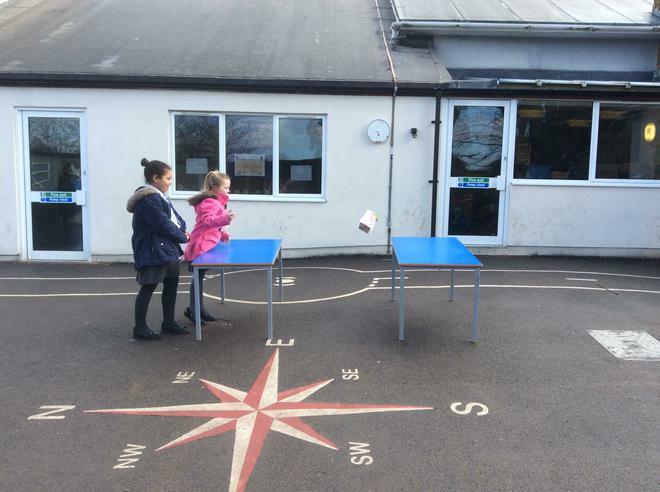 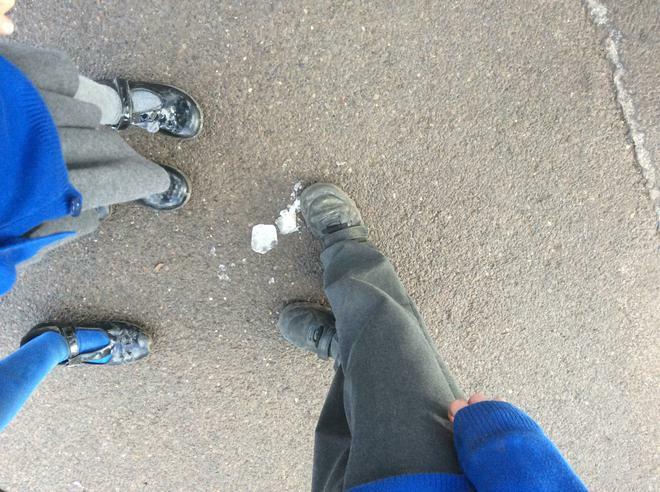 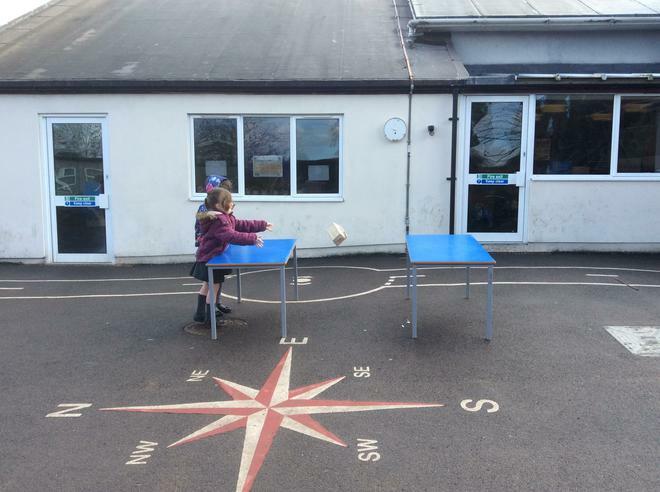 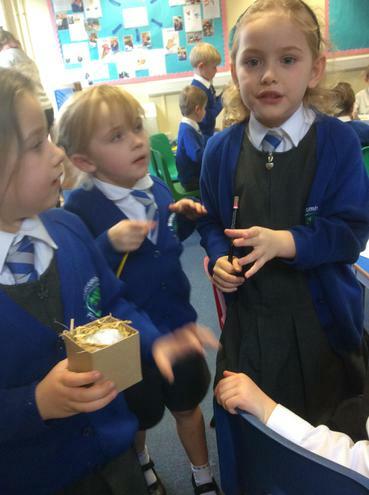 We tested materials for their suitability, designed and made containers to protect the egg and tested out our products. 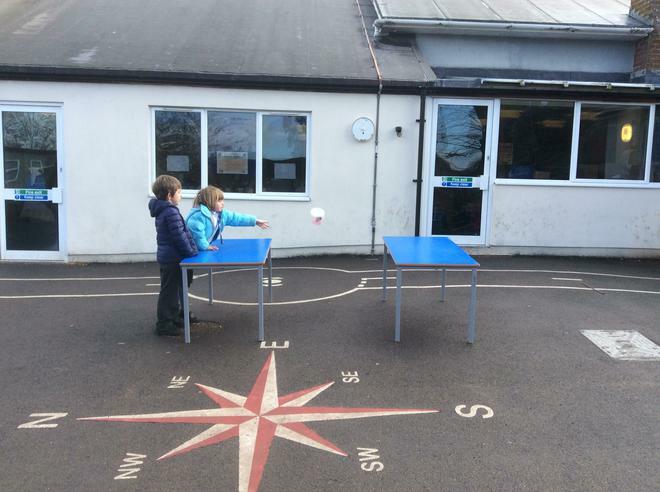 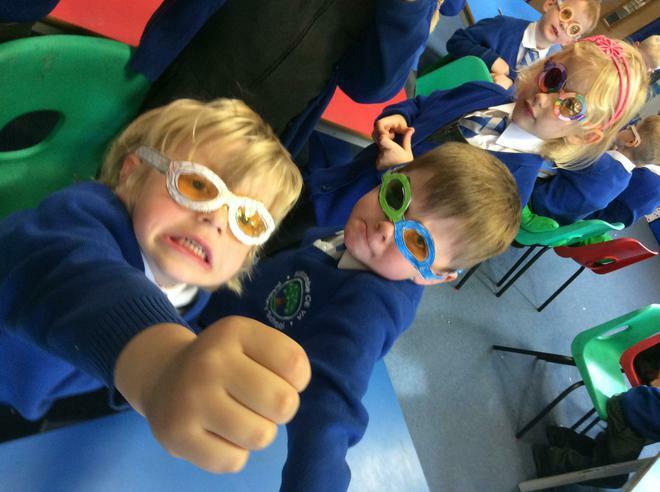 It was Safer Internet Day this week. 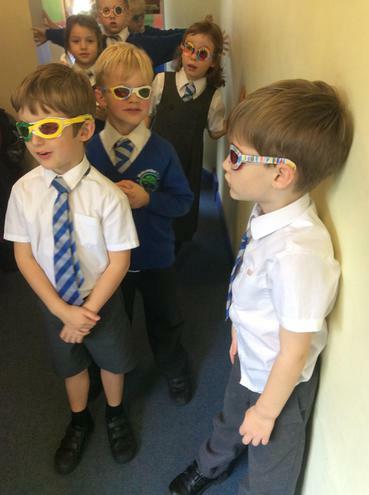 We looked at a story about a penguin who learns how to stay safe while online. 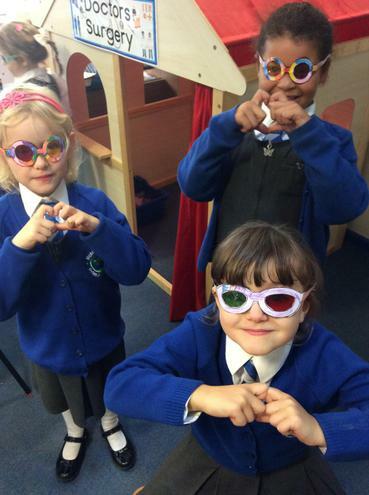 We thought about what we would do if we saw something online that made us feel worried or unhappy. 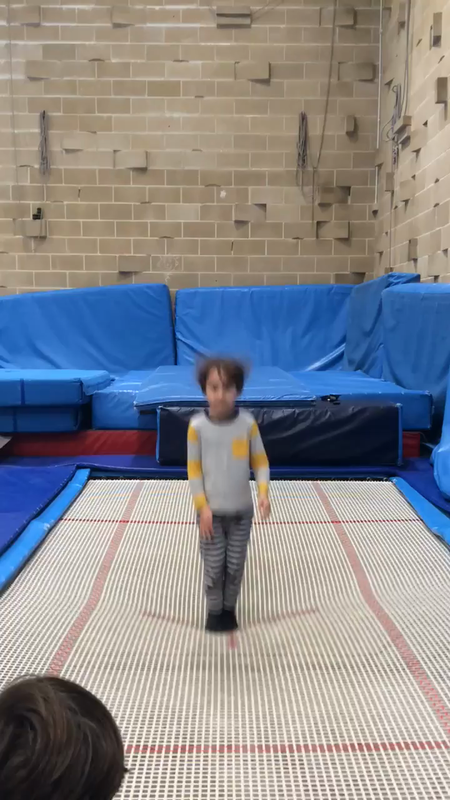 We all know who we would tell if this happened while at home or at school. 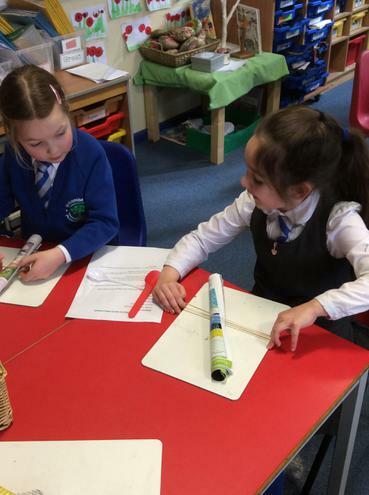 We have been exploring poetry this week. 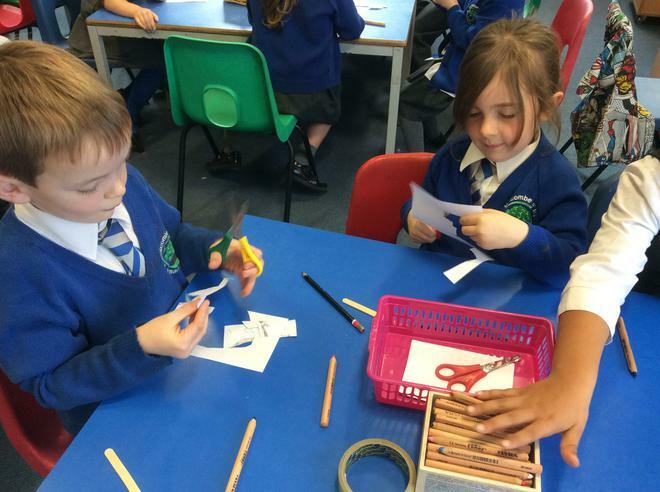 We created actions for a class poem and wrote poems of our own. 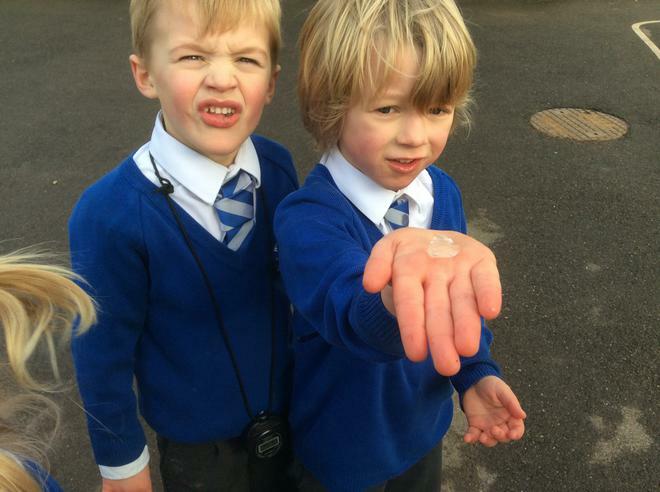 Ice challenge! 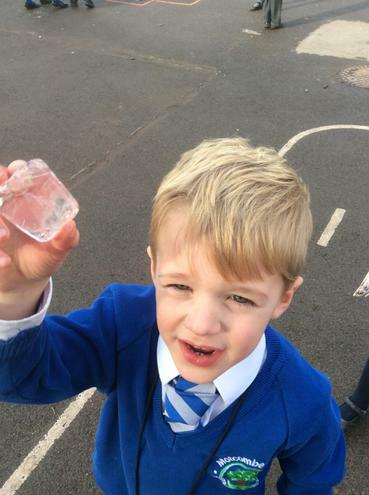 Which team can make their ice melt quickest? 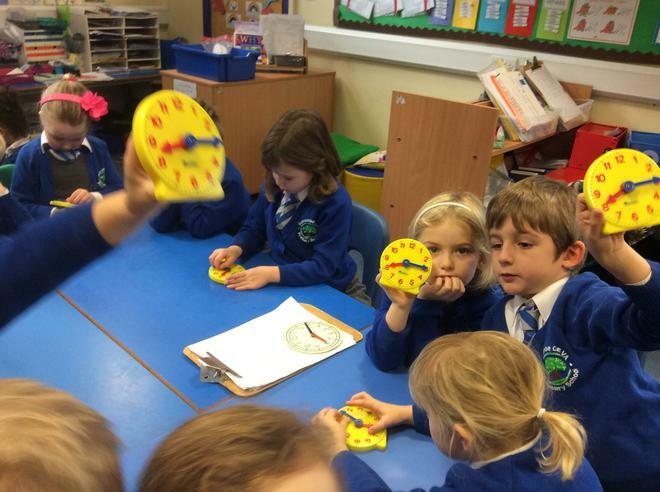 We used stopwatches to time how long each team took. 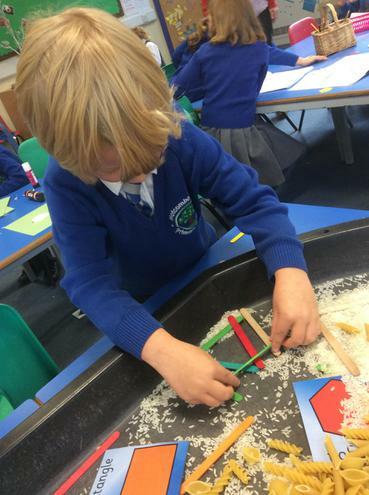 Take a look at our Arctic and Antarctic dioramas. 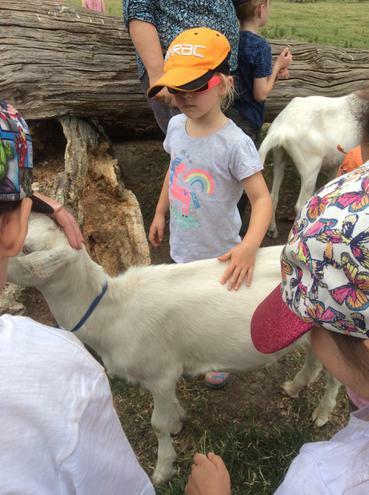 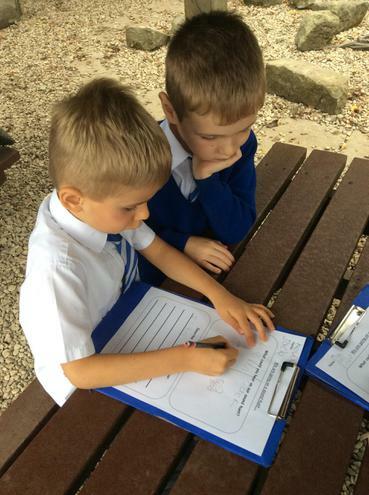 We thought carefully about the animals that belong in each habitat. 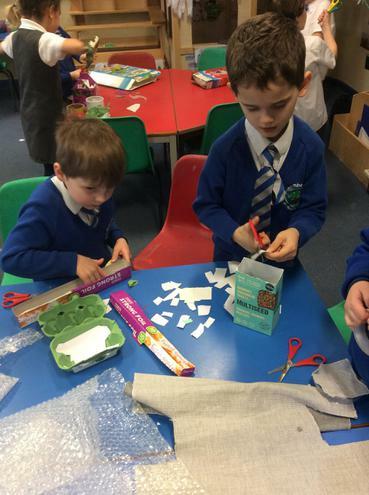 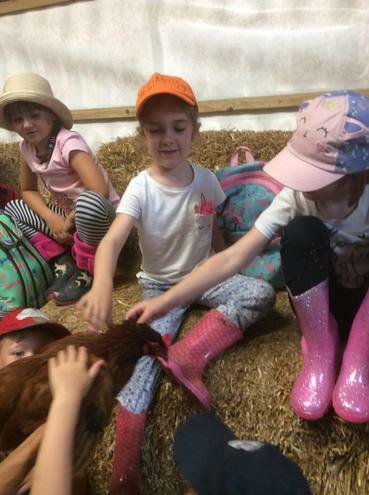 We wanted our animals to stand out so we thought of ways to make them stable inside our boxes. 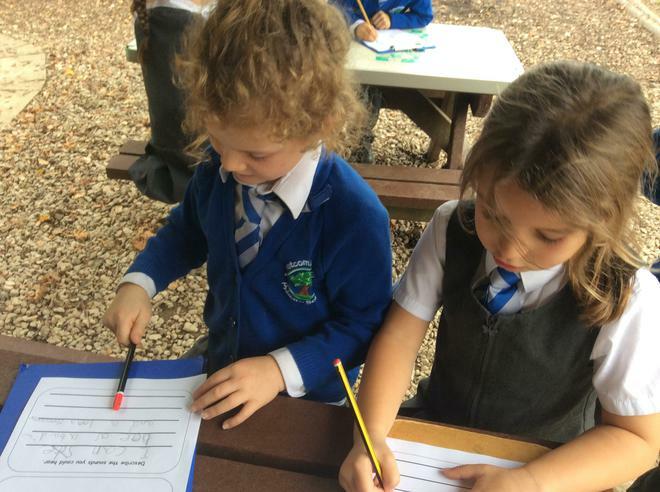 We really enjoyed sketching polar animals this week. 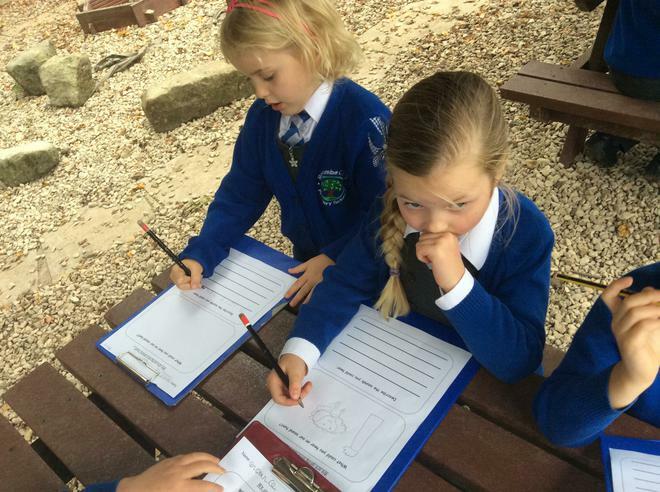 We used cross hatching and stippling to add detail to our drawings. 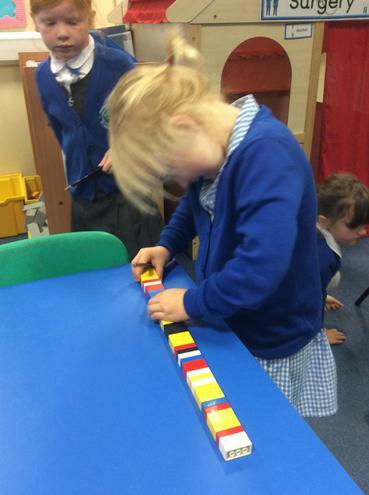 We have been partitioning in maths this week. 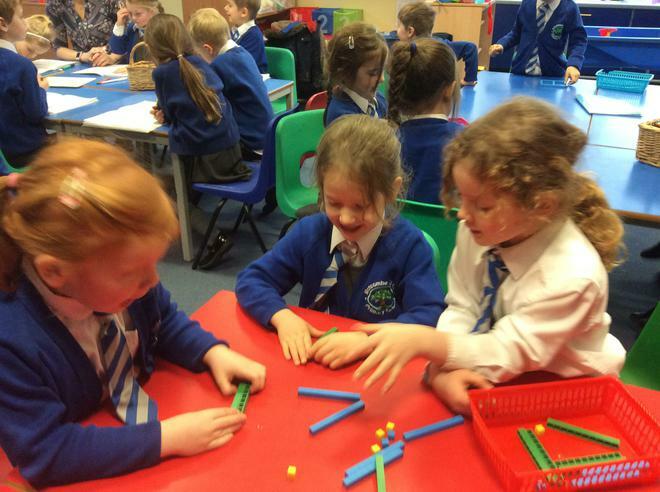 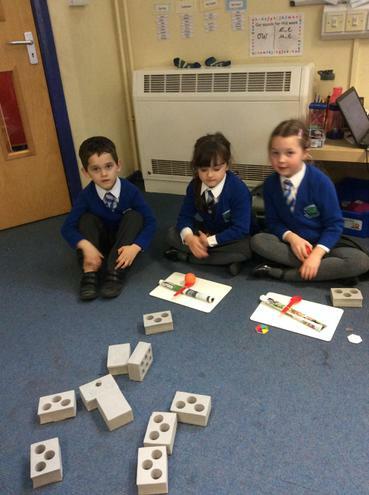 We have made numbers using dienes and Numicon and used drawings to show our understanding of place value. 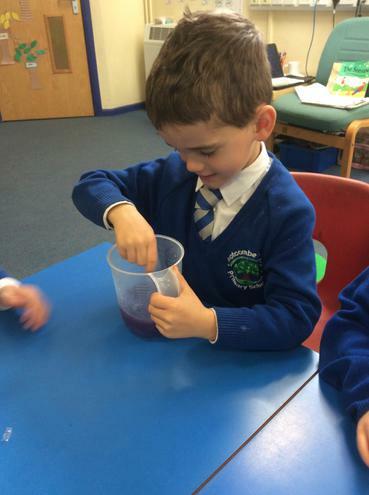 We have been colour mixing in art. 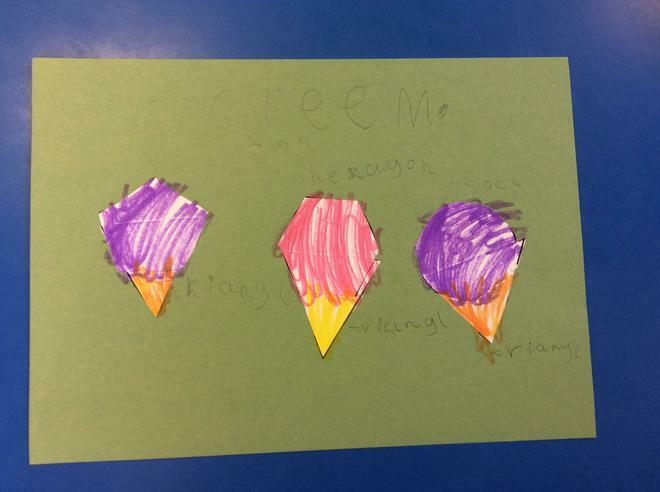 We know the difference between warm and cold colours and mixed a range of warm colours. 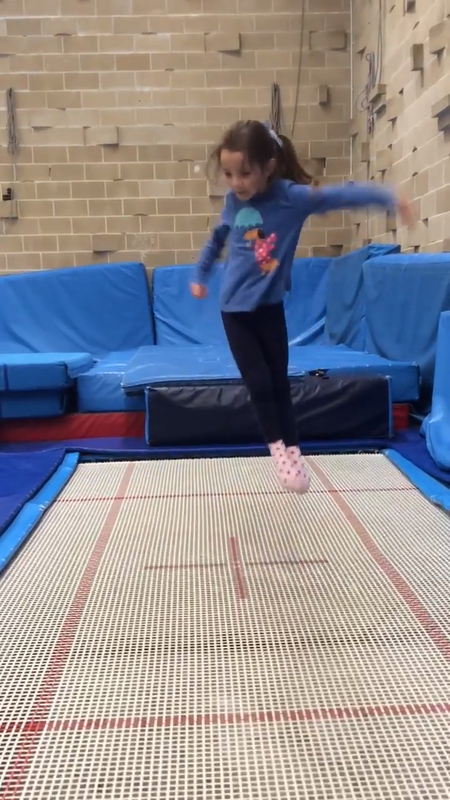 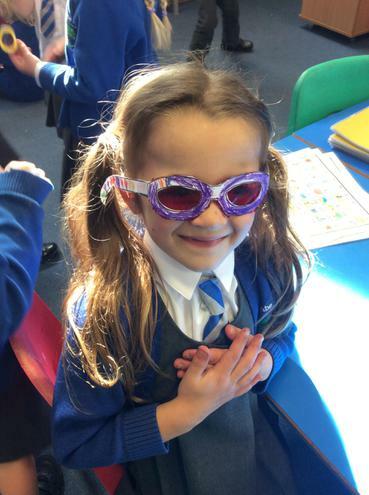 We enjoyed yoga and gymnastics! 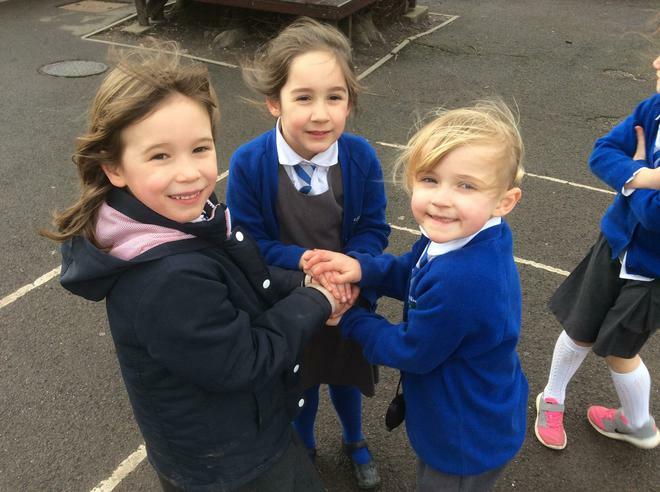 We worked hard to hold balances and move our bodies in different ways. 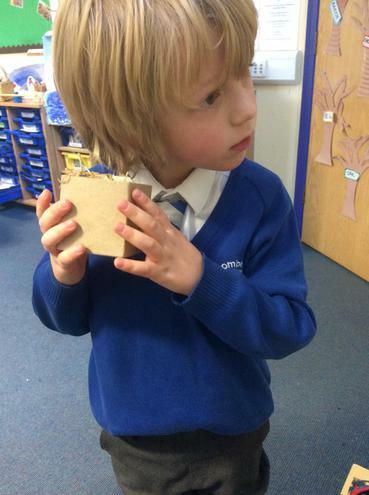 We received a mysterious delivery this week. 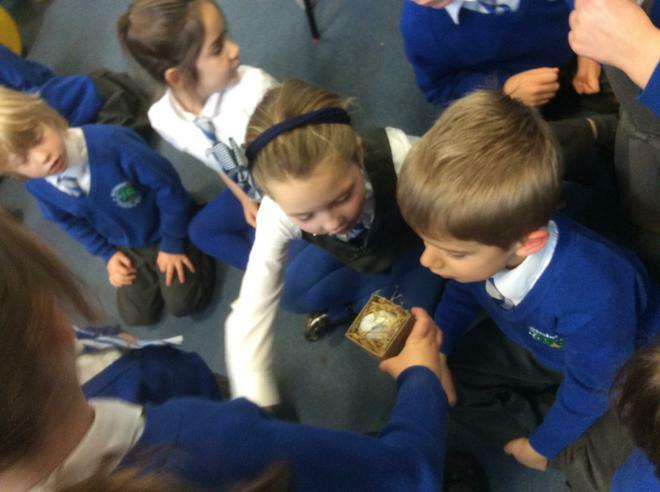 An abandoned egg from the Arctic arrived on Friday afternoon. 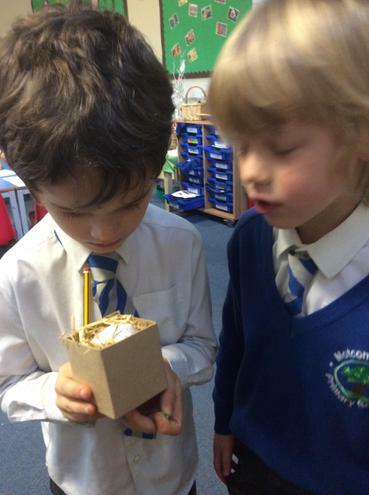 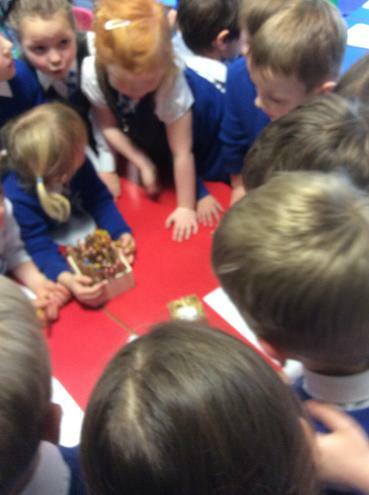 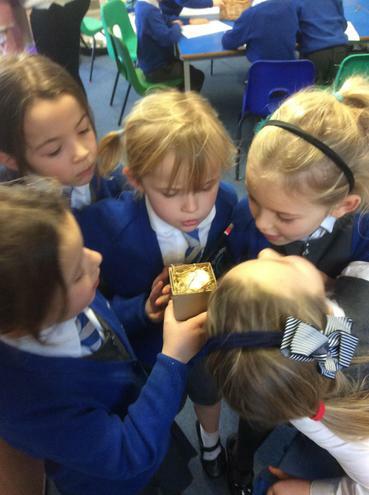 We have been thinking carefully about what could be inside and observing closely! 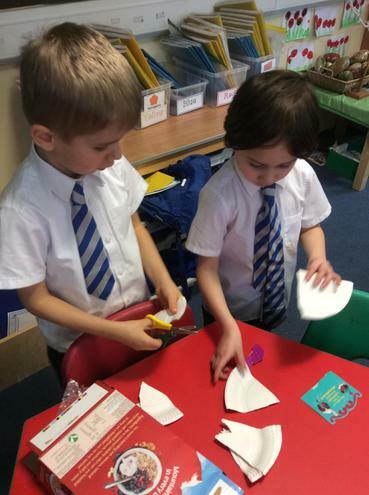 We will continue our 'Me, Myself and I' topic for the rest of this term. 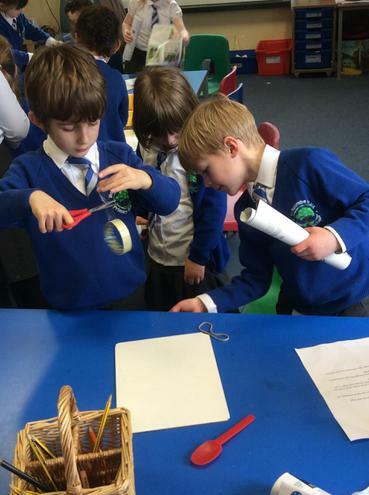 Take a look at the documents below to see what we will be learning about this half term. 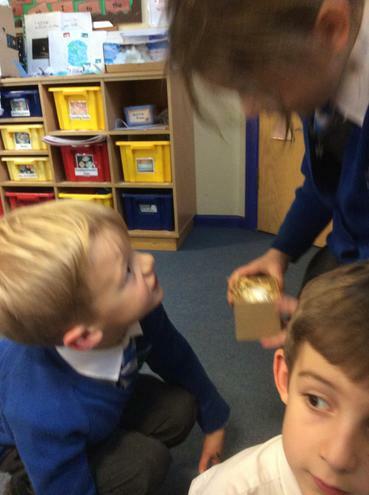 Santa says "The best place to store your candy canes is in the snow." 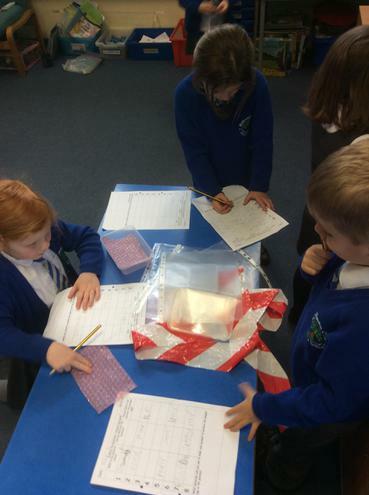 We investigated this to find what happened when we stored candy canes in different ways. 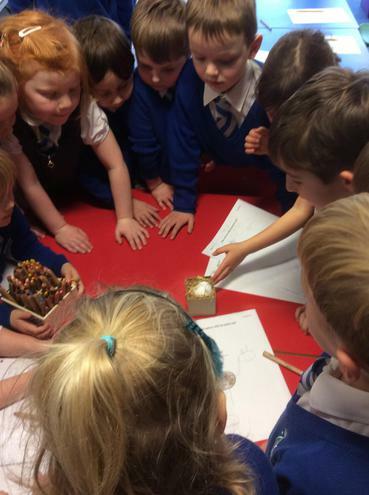 We made predictions, recorded our observations and made simple conclusions. 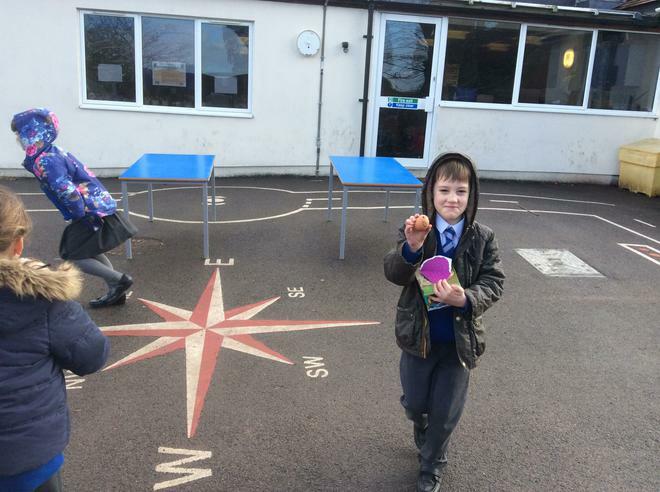 A huge thank you to the PTA for serving us our Christmas dinner, it was delicious! 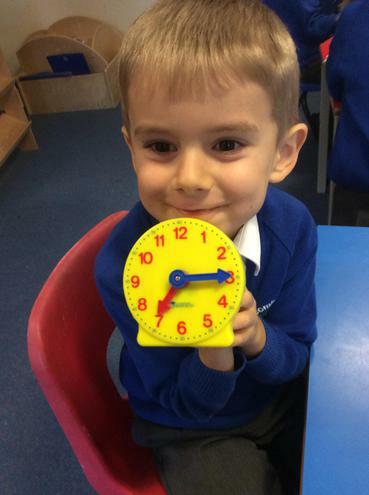 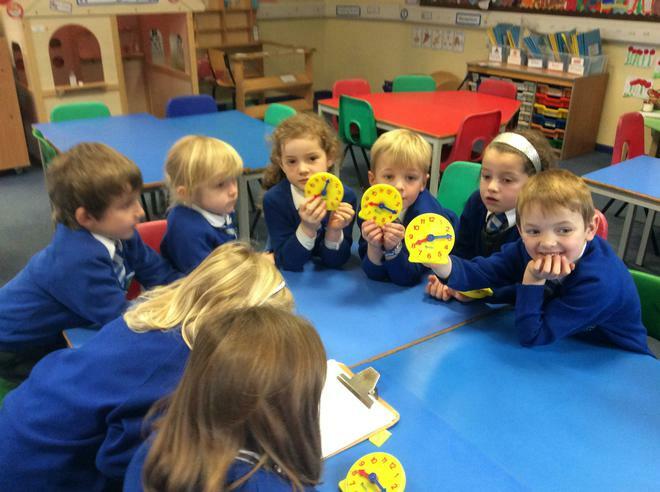 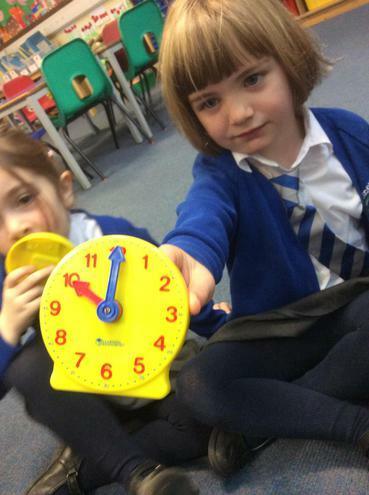 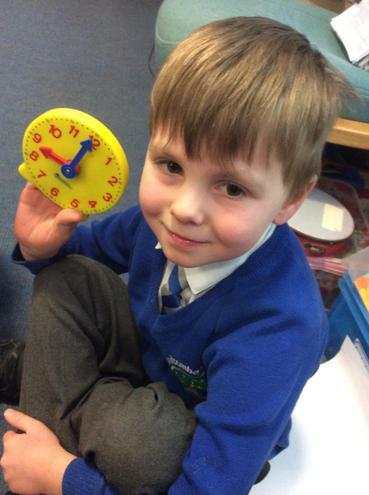 We have become more confident when telling the time! 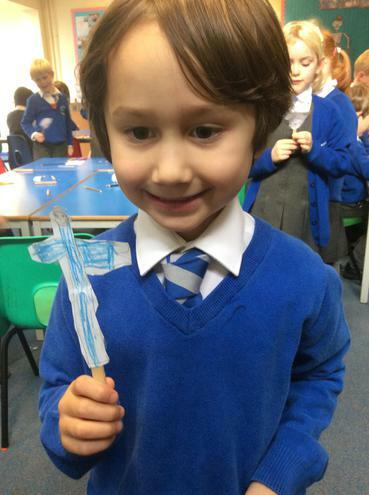 We celebrated St Andrew's Day in class. 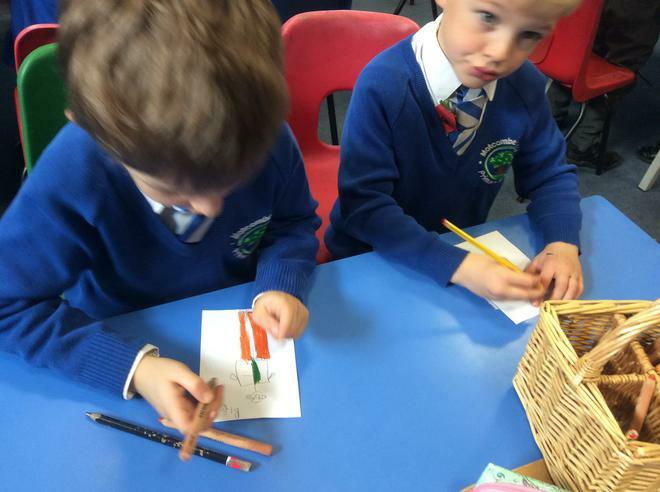 We learned about Scotland, its capital and different Scottish traditions. 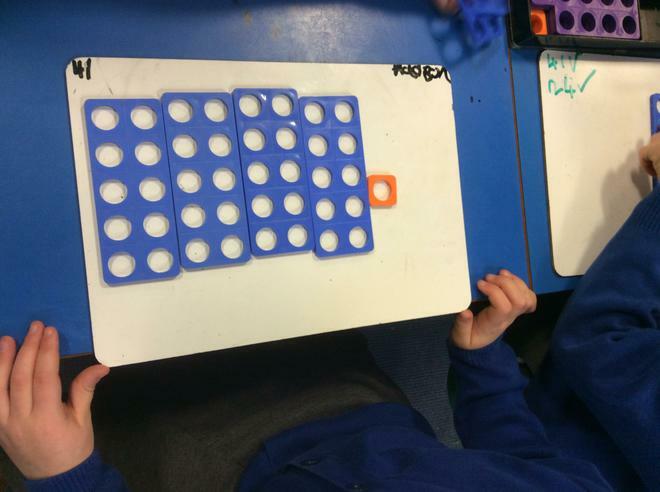 We explored fractions in maths this week. 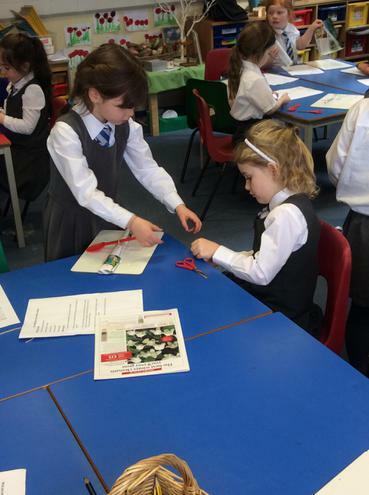 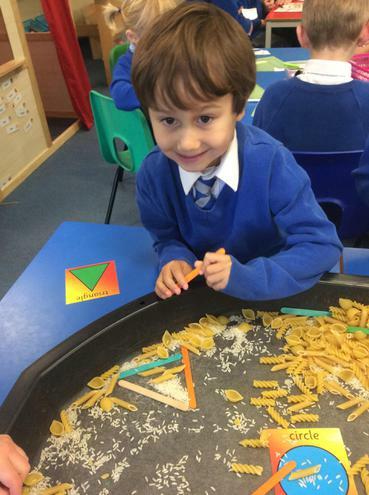 We looked to see if shapes could be halved or quartered equally. 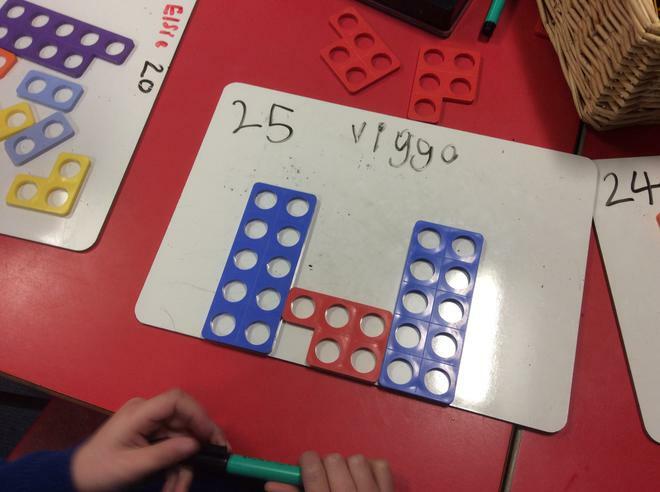 We discussed the importance of each half or quarter being equal. 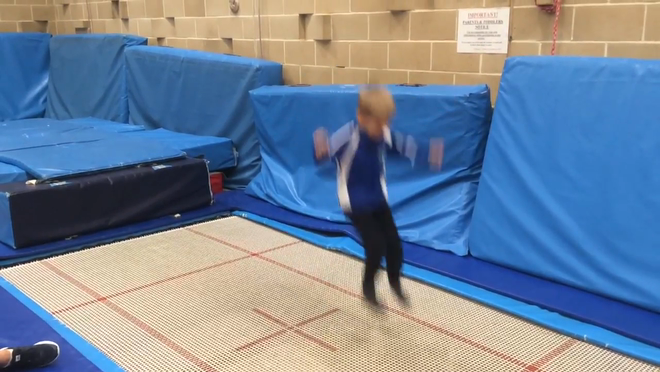 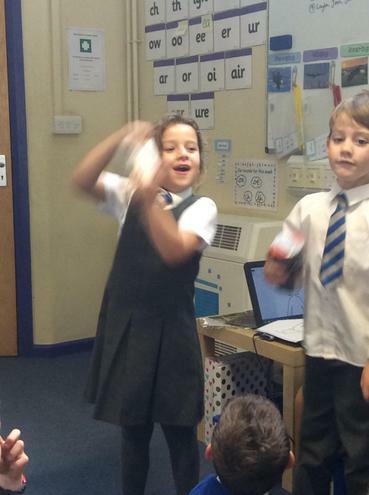 In PE, we created our own poses and movements to show different parts of a skeleton story. 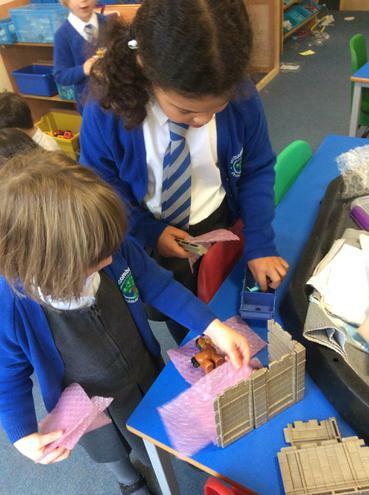 We have been exploring a new story this week 'Mr Gumpy's Motor Car.' 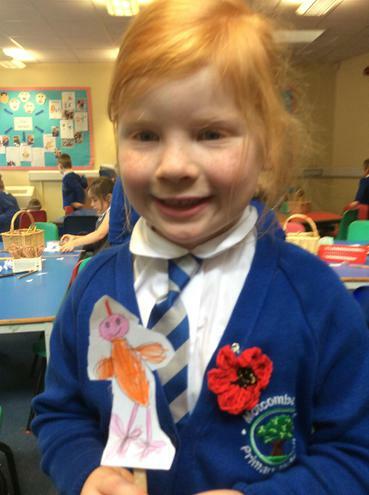 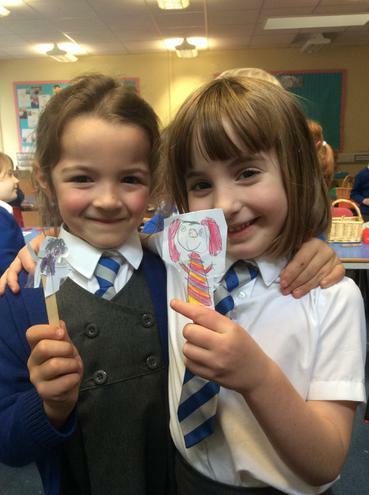 We made character puppets, used small world to act out the story and drew story maps. 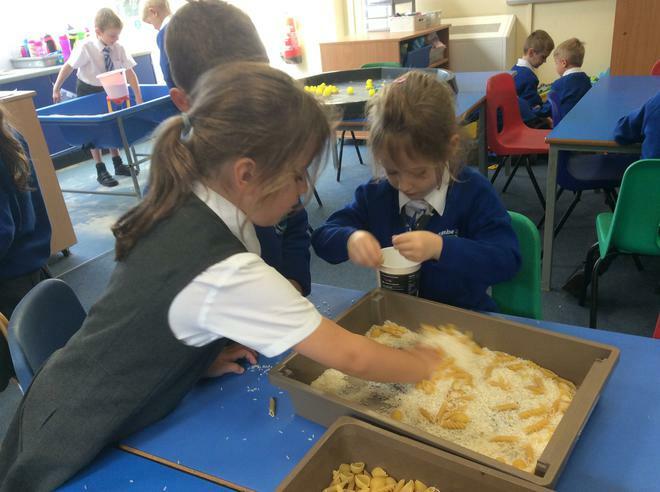 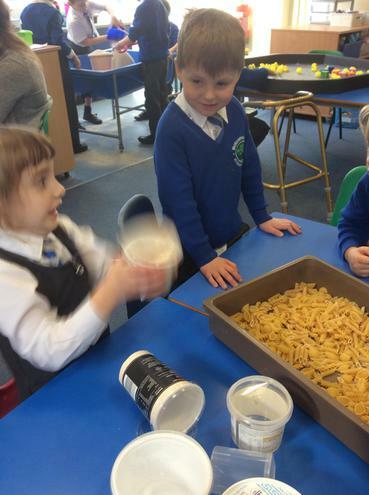 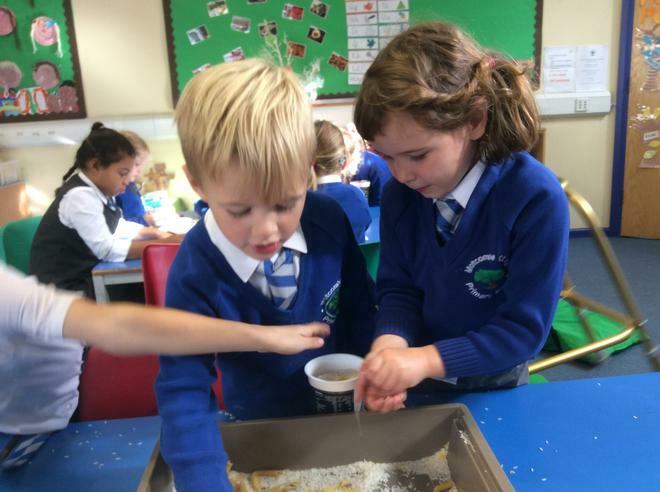 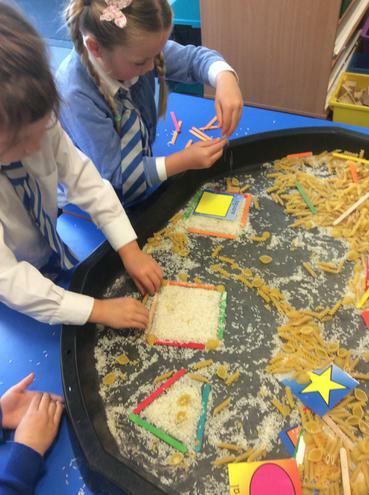 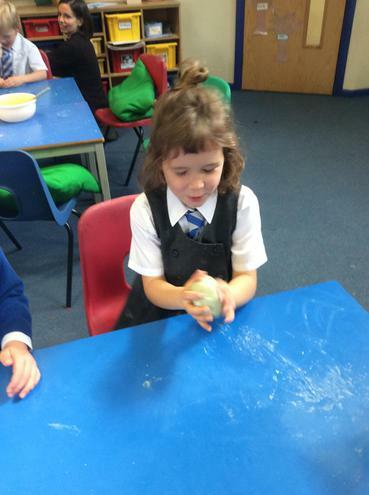 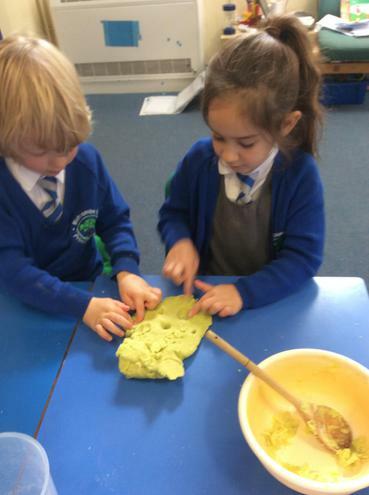 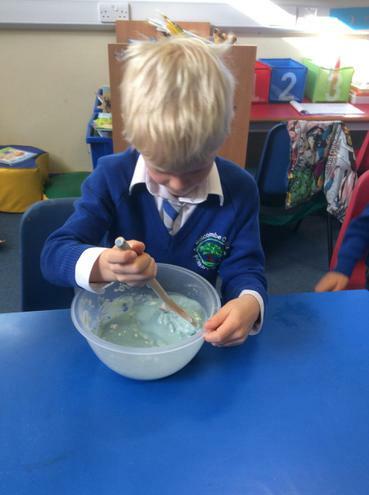 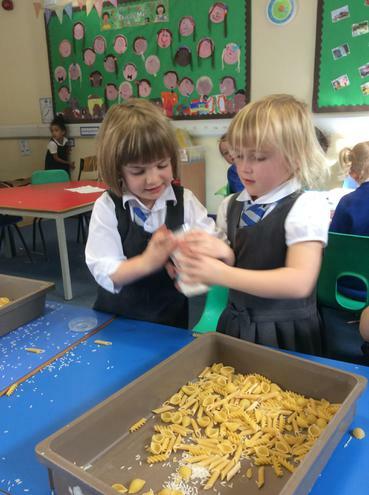 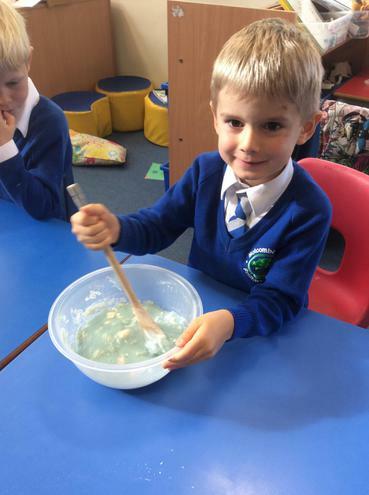 We followed recipes to make different types of sensory playdough on Friday. 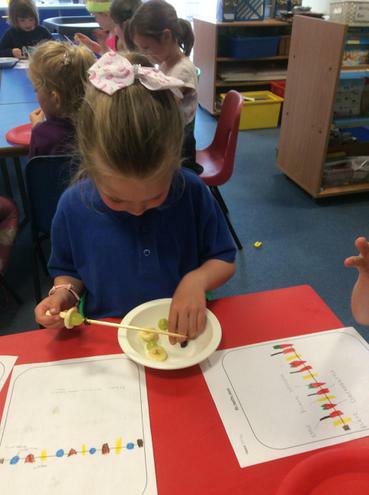 We measured our ingredients accurately and made observations using our senses throughout the making process. 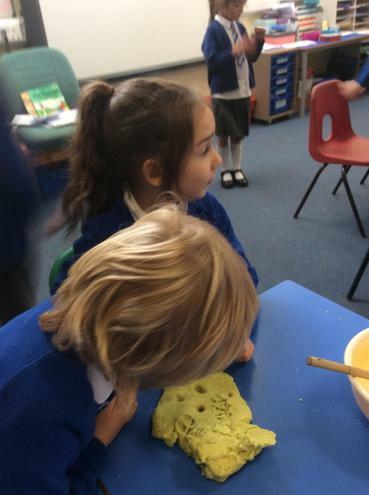 We used the playdough in groups and compared the texture, look and smell of each dough. 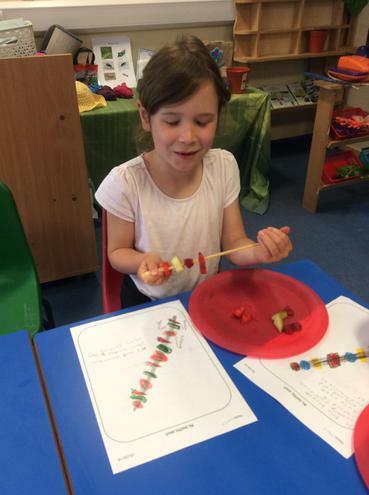 We used the terms sweet, salty, sour and bitter to describe the taste of different foods. 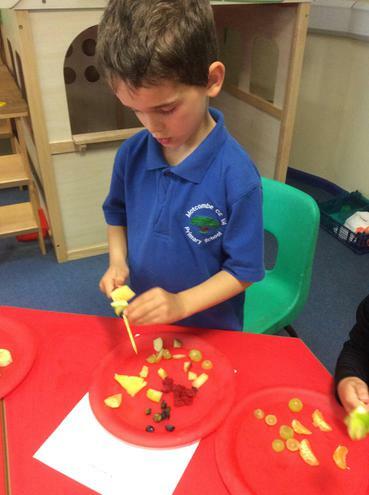 We used our sense of smell to identify and describe different food and drink. 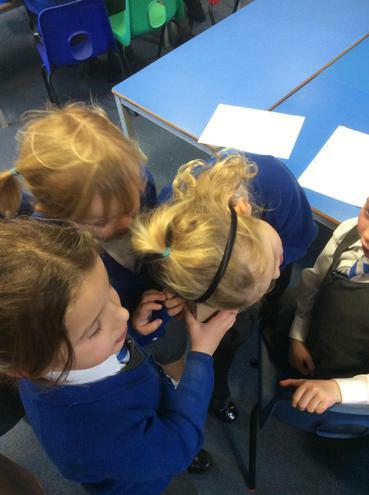 This week, we explored our sense of hearing. 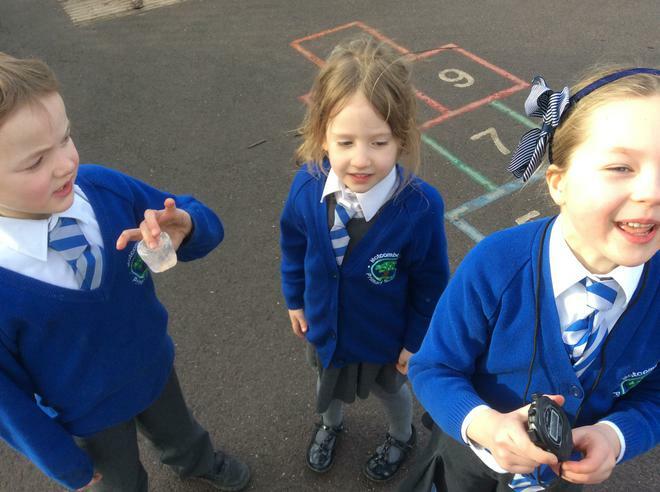 We went on a sound hunt around the school grounds and recorded what we could hear. 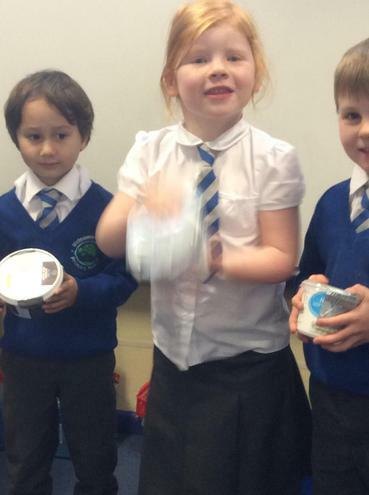 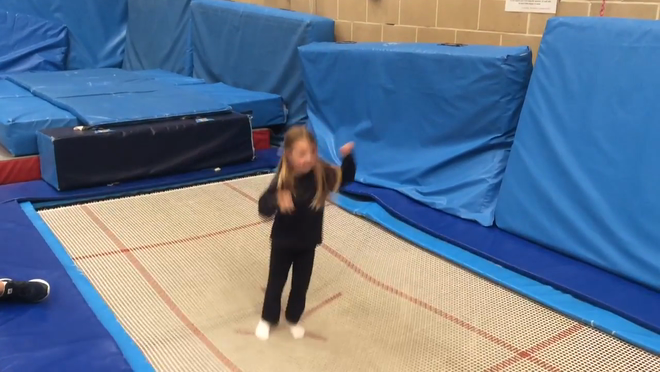 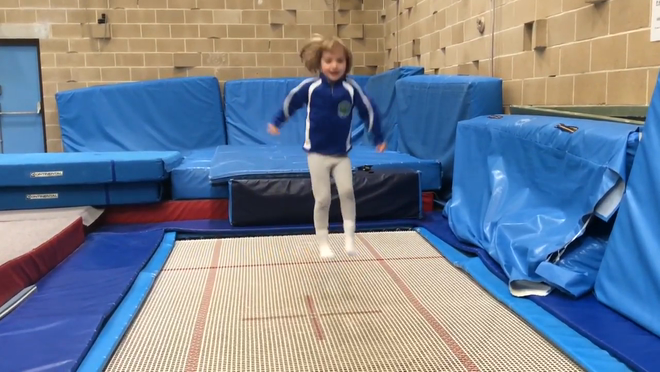 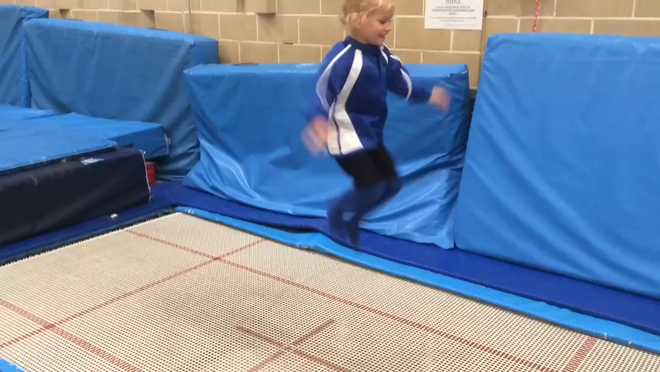 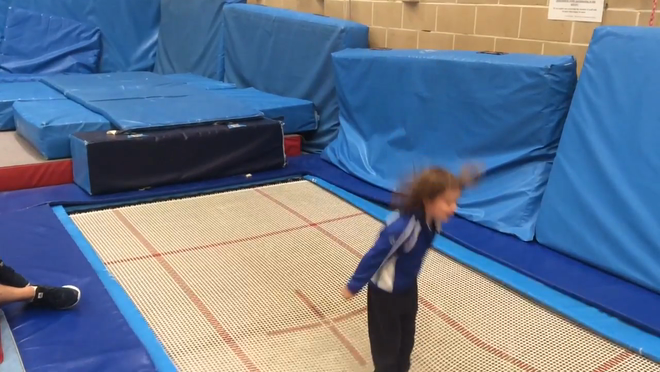 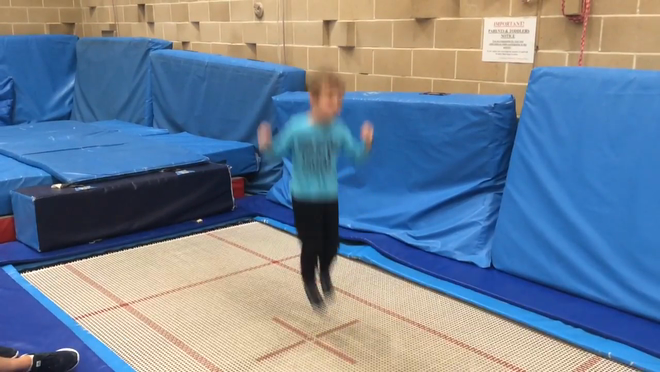 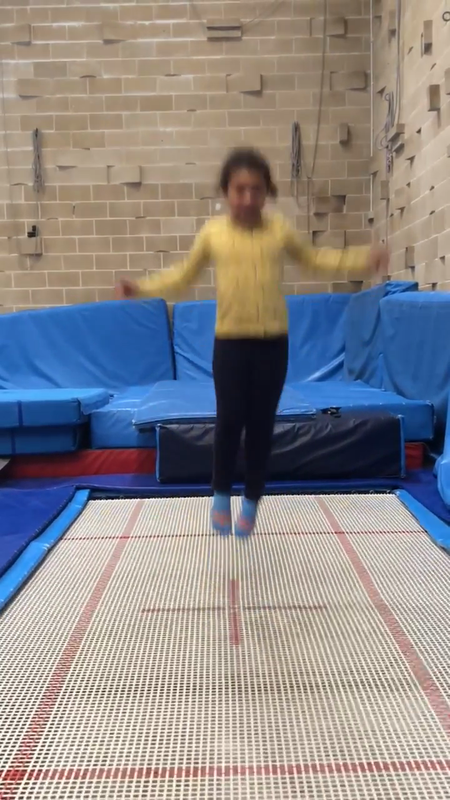 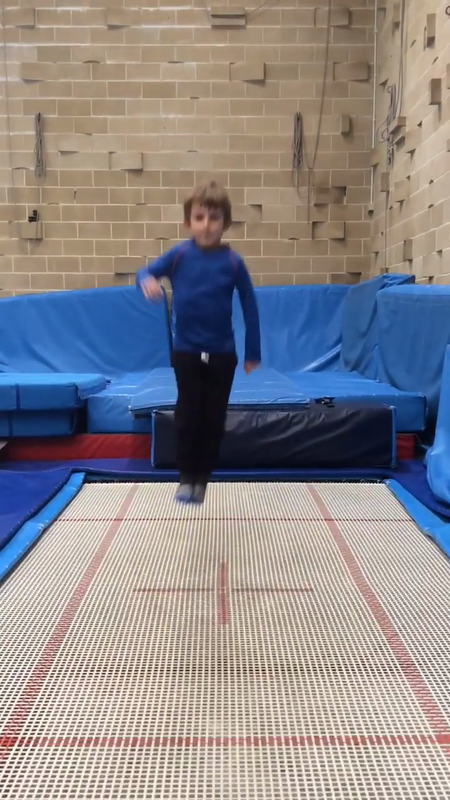 We had fun trying to make the loudest shaker we could and had even more fun testing them out! 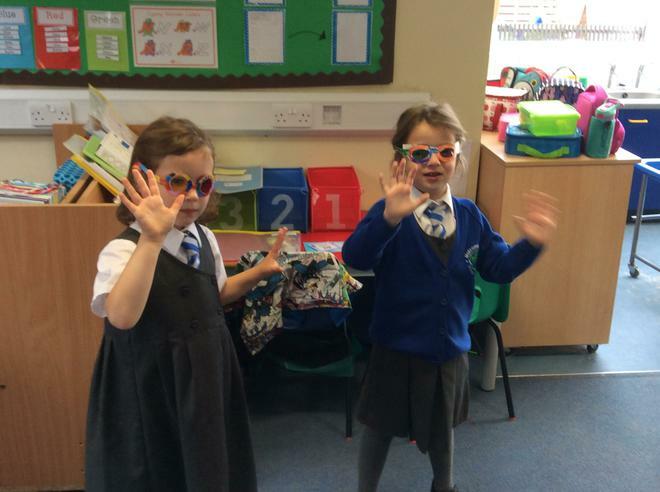 We have been exploring our sense of sight this week. 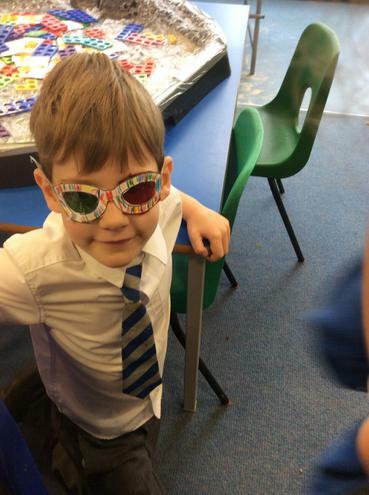 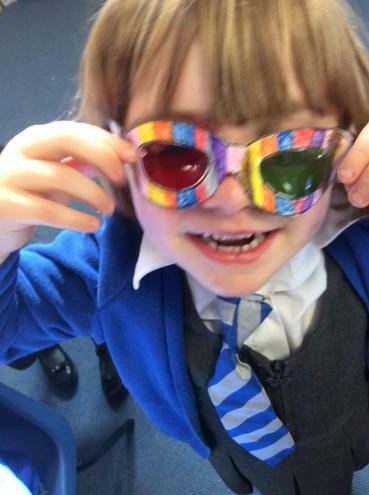 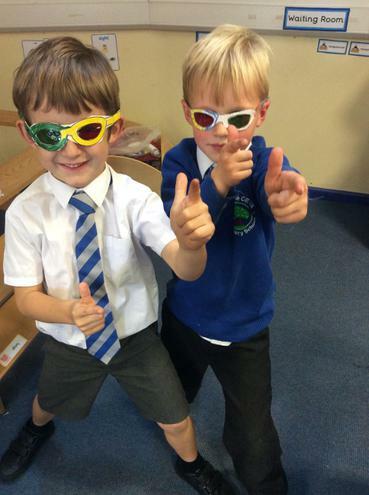 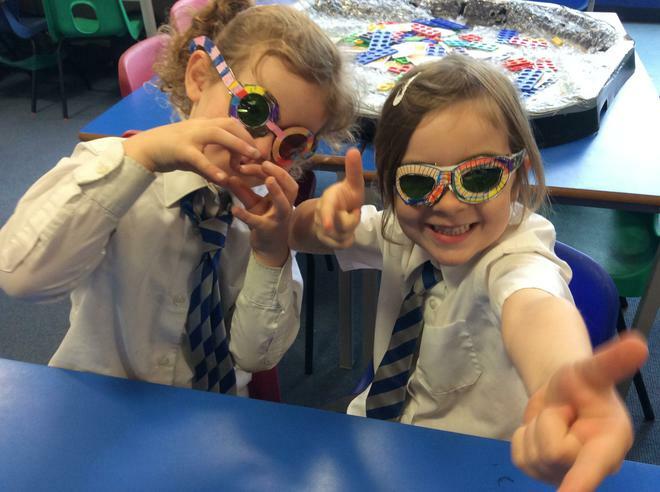 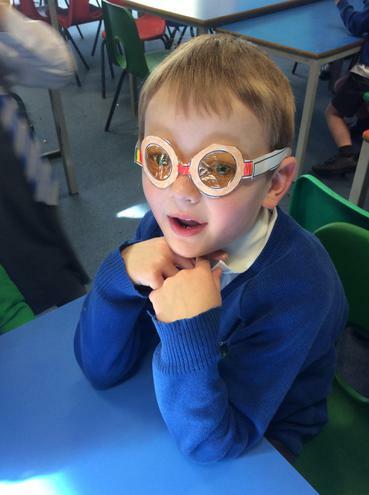 We followed instructions to make glasses with coloured lenses and explored the school wearing them. 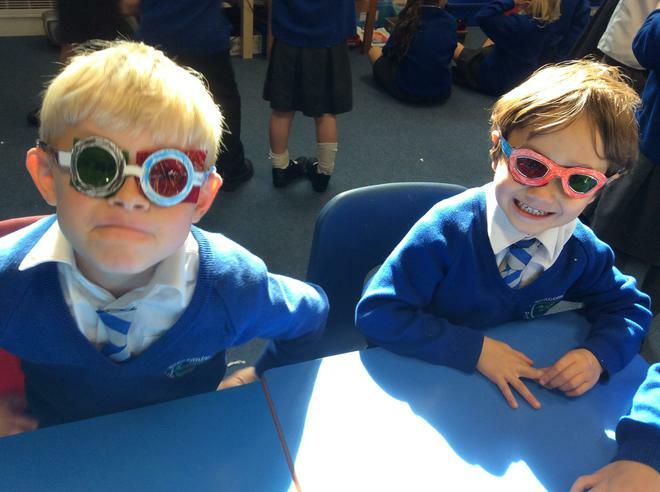 We discussed why our sense of sight is important and thought about how it felt when our sight was different. 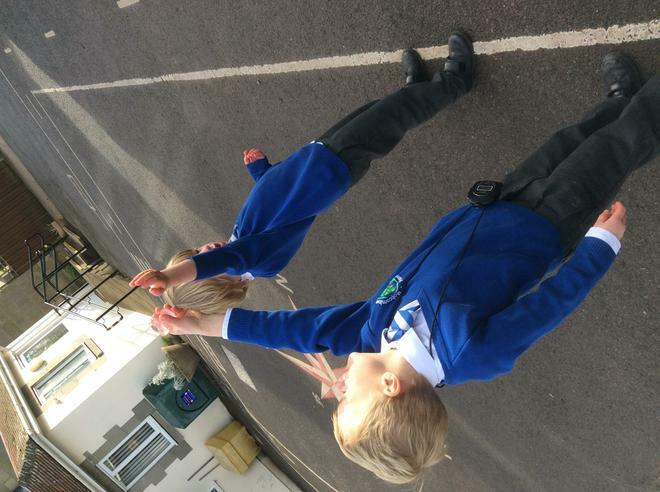 We worked in pairs to mirror movement and balances. 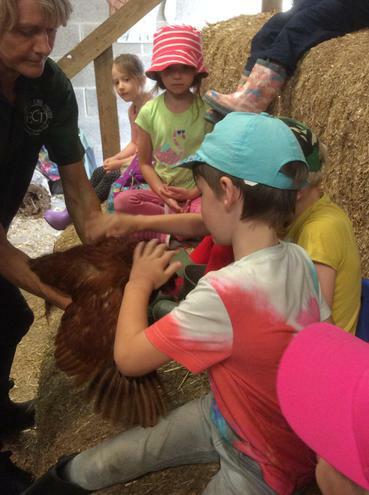 We had to pay close attention to what our partner was doing. 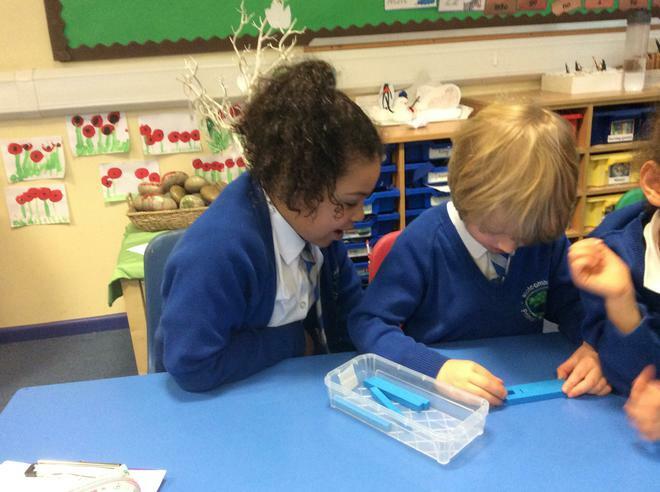 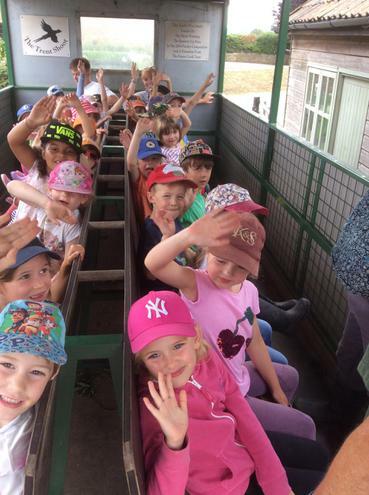 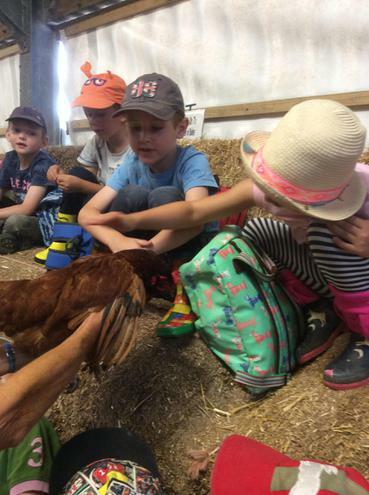 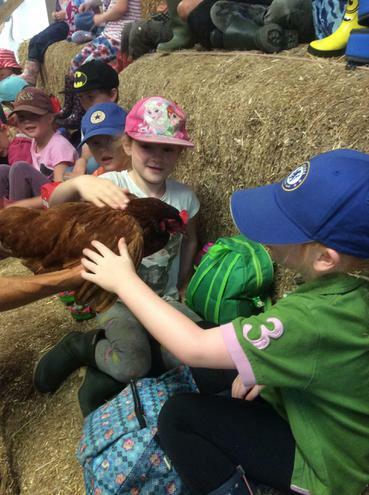 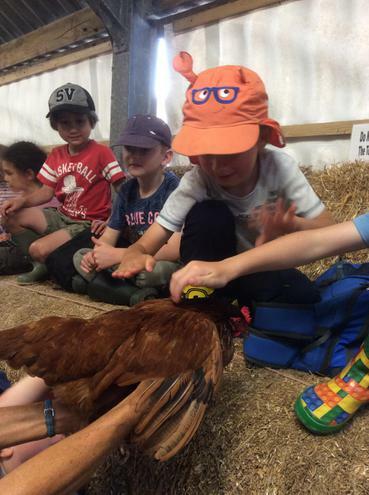 We thoroughly enjoyed our duck visitors this week. 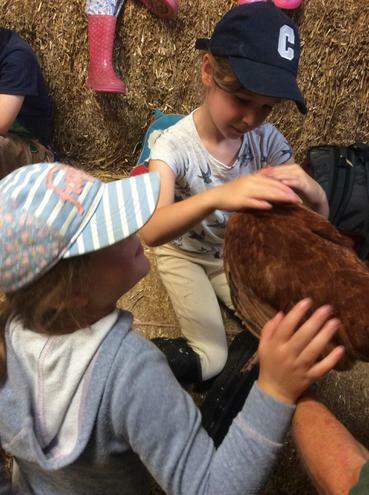 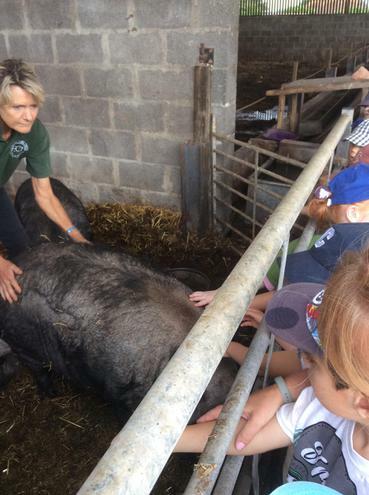 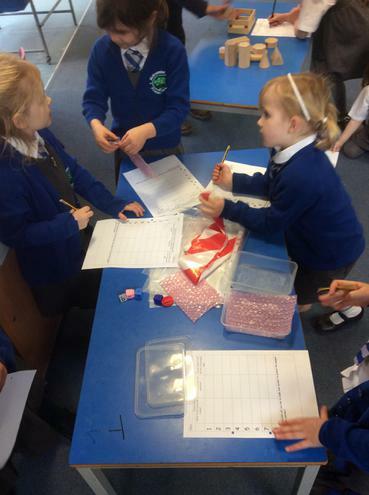 A massive thank you to Mr Rowely for teaching us all about them. 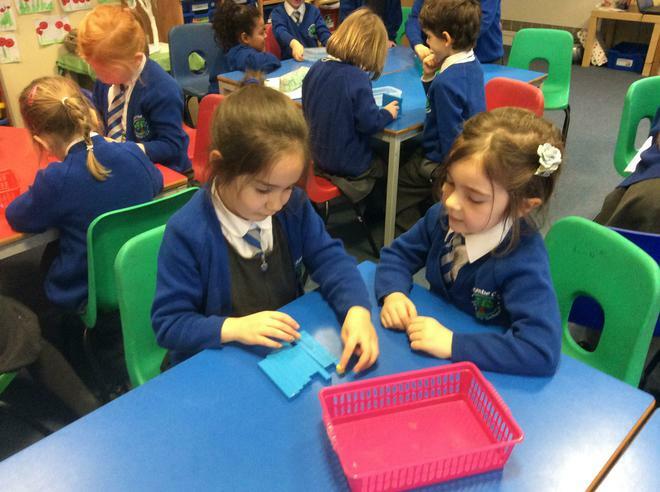 We have been talking about our homes this week. 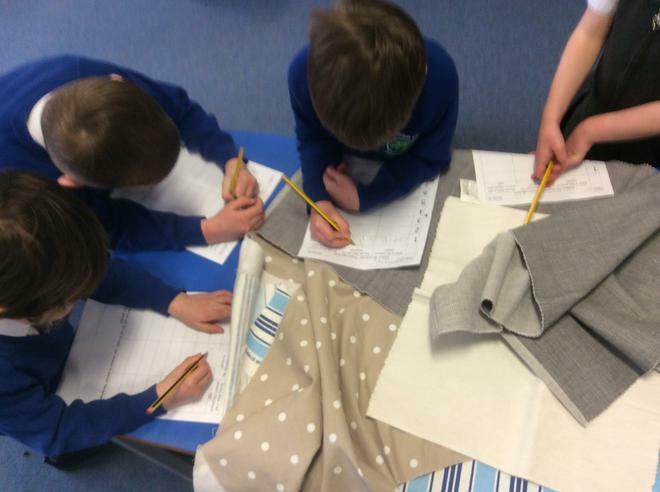 We have considered what makes our homes special and how they keep us safe. 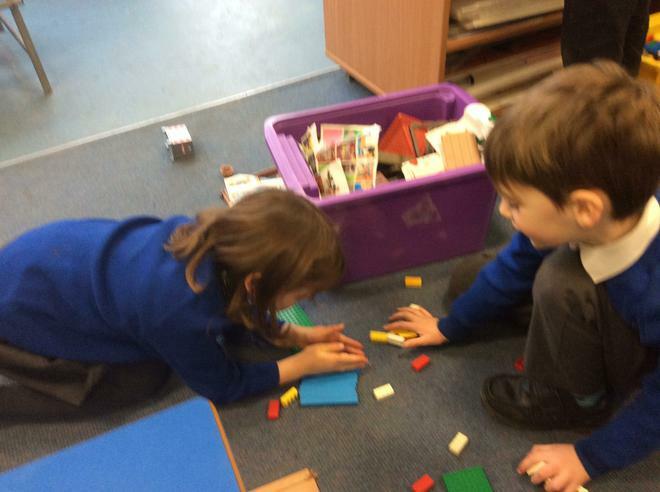 We looked at how houses have changed over time and painted pictures of our own homes. 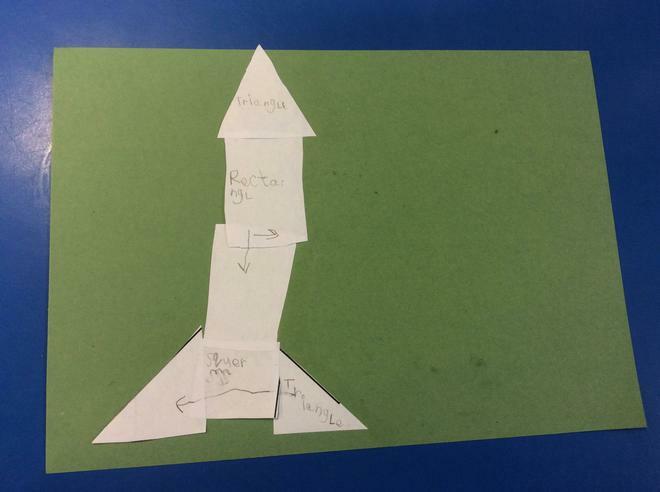 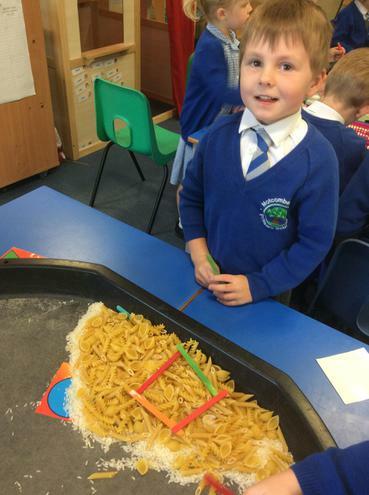 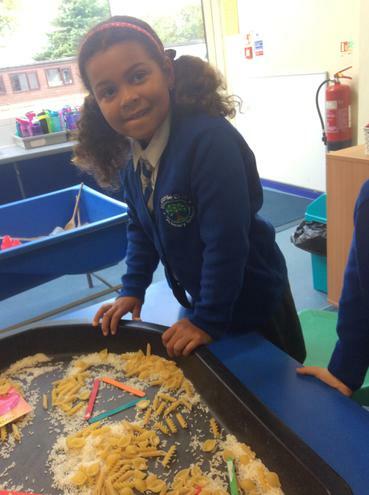 We have been exploring shape this week. 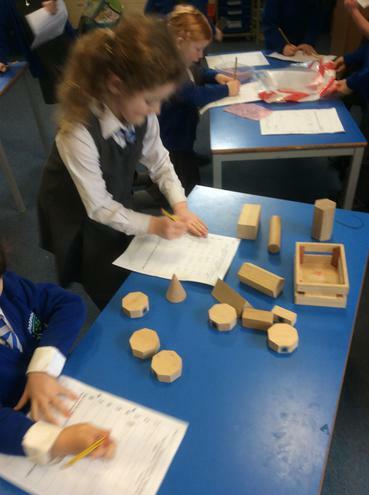 We can name a range of different shapes and describe their properties. 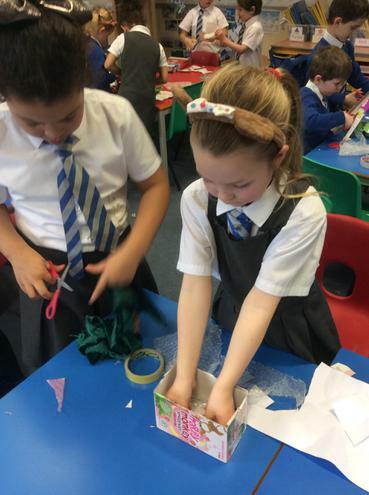 Our story character, Claire, has a bad knee in the story. 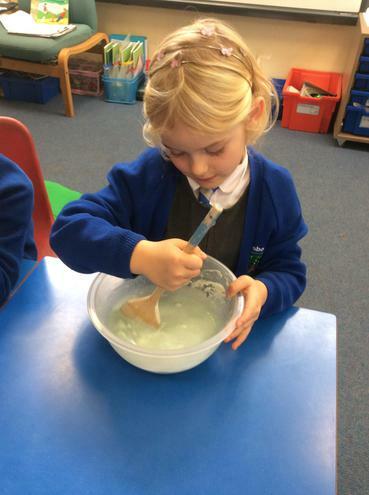 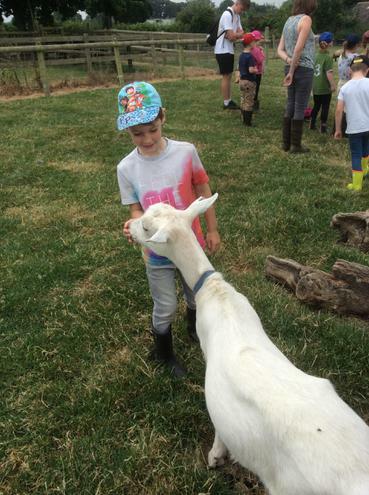 We each created a medicine to help mend her bad knee. 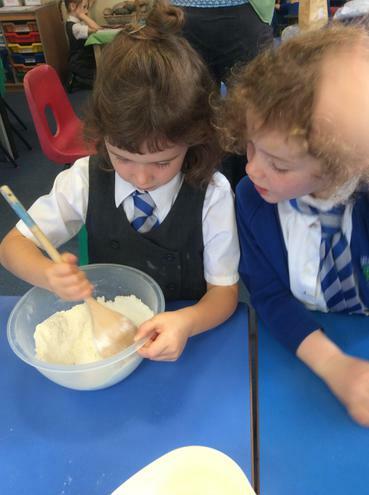 Some of us had a go at writing the recipe. 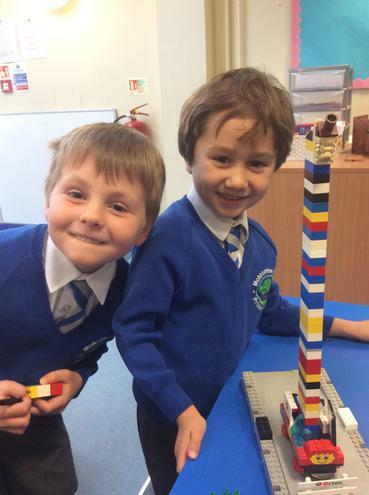 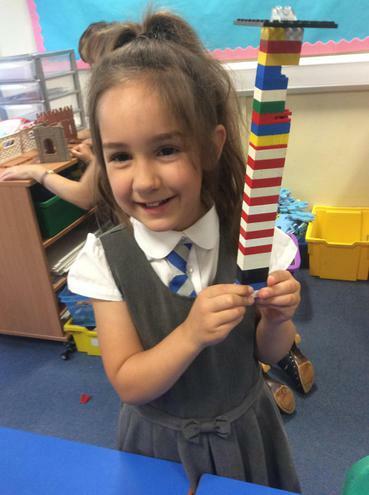 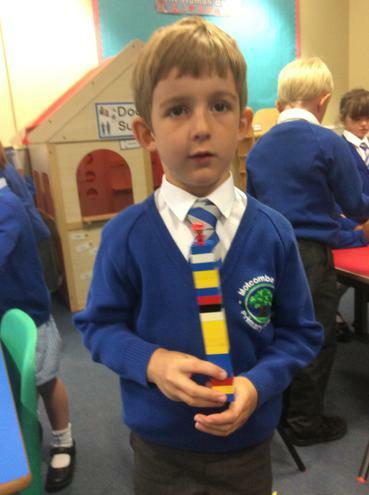 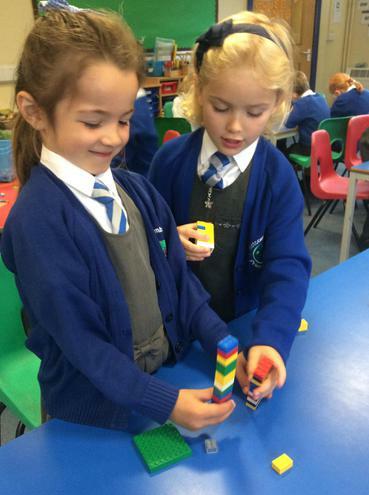 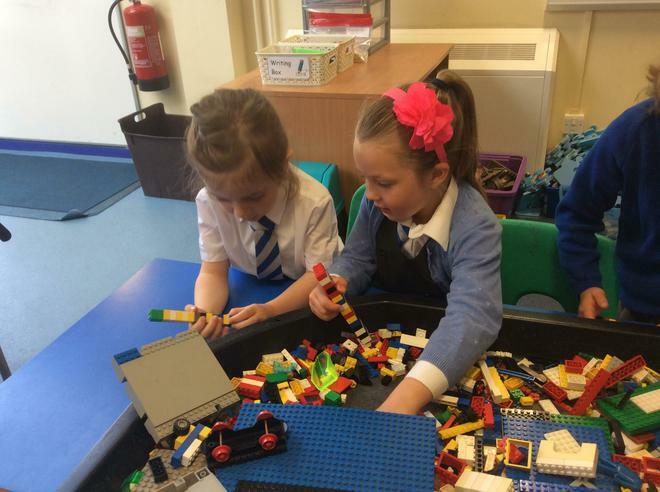 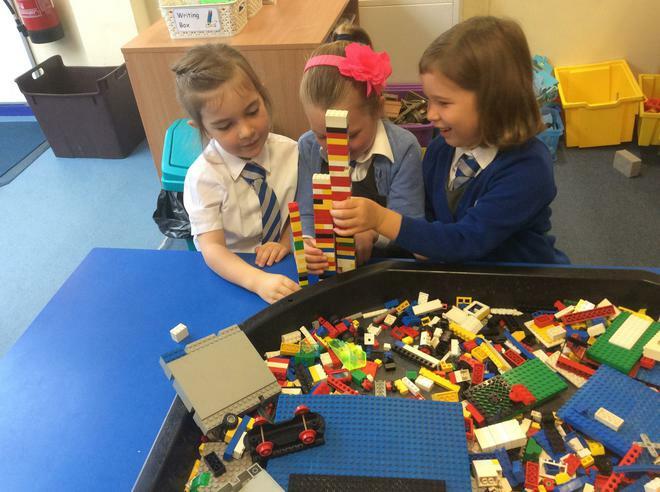 Who can build a tower using the most bricks? 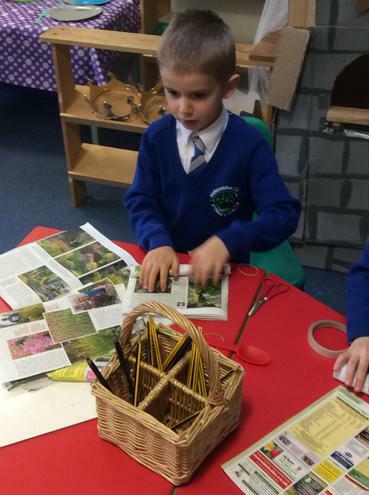 We really enjoyed exploring the text 'Willy the dreamer' this week. 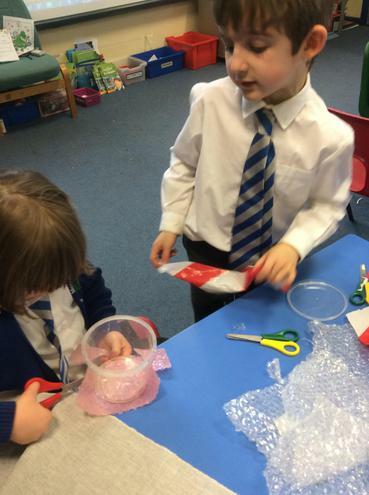 We made dream catchers to share in assembly. 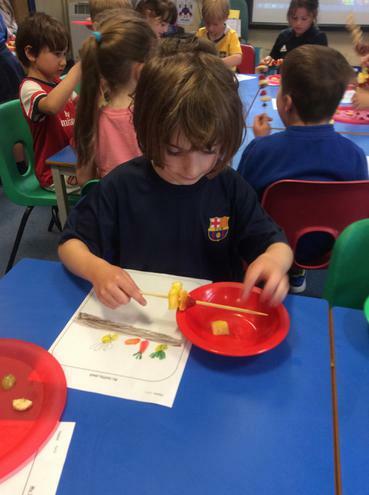 Thank you to parents to who came along to the 'meet the teacher' session after school today. 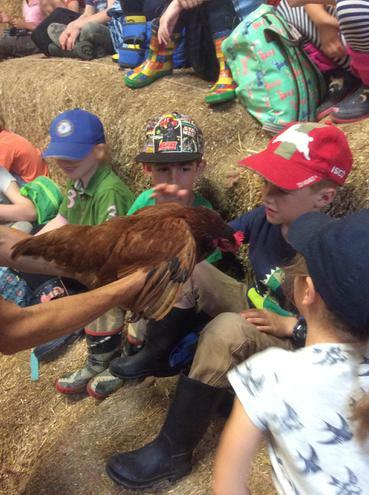 It was lovely to meet you all properly.